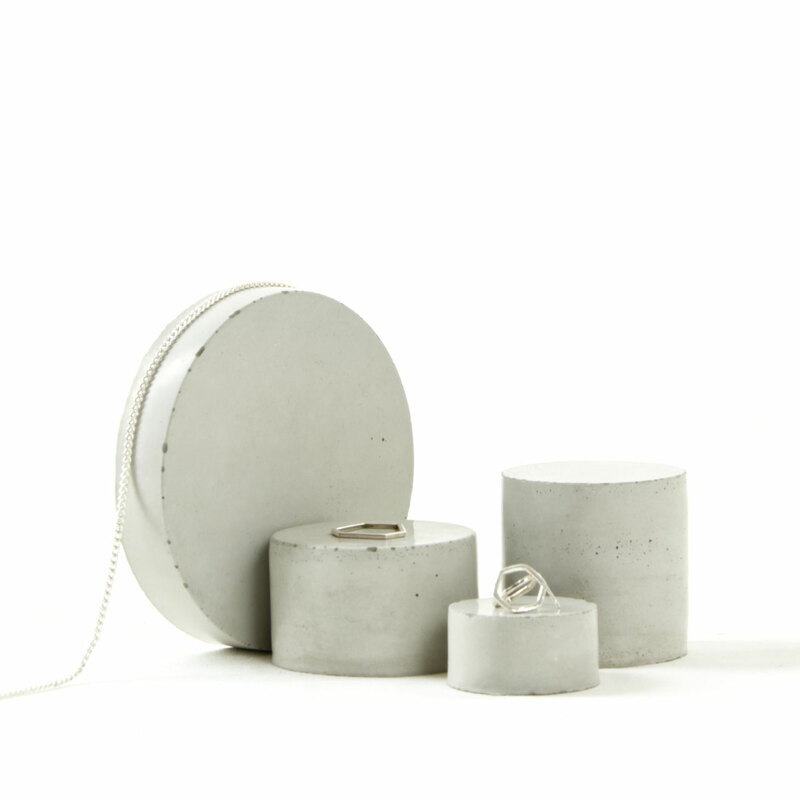 A set of three stackable pale grey concrete cylinders to create various stunning displays for your jewellery, pins or cosmetic products. 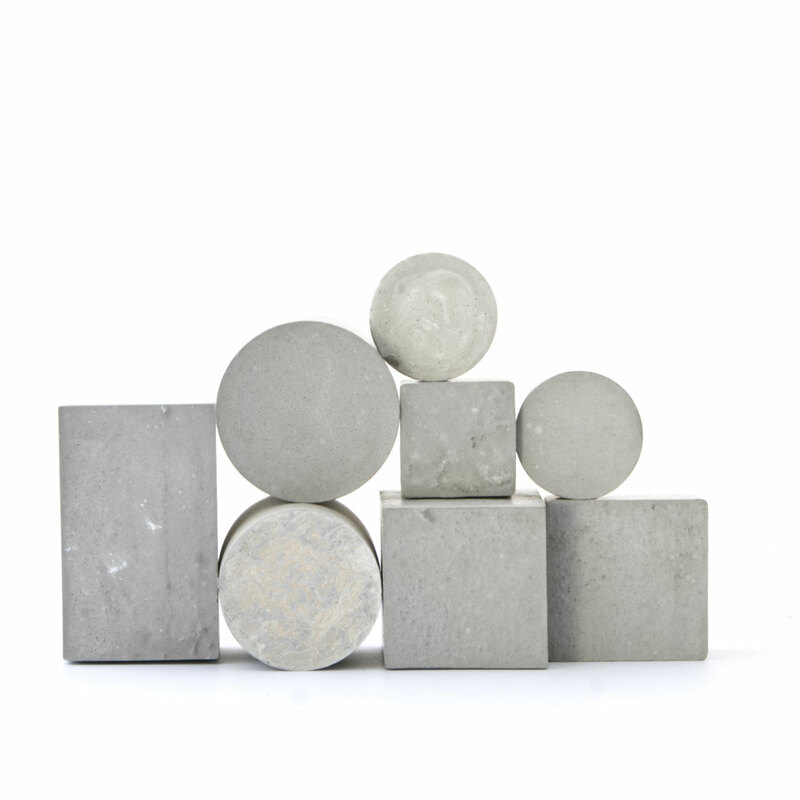 The raw geometric concrete comes in different shades of pale grey providing a wonderfully soft contrast to the items you intend to display. 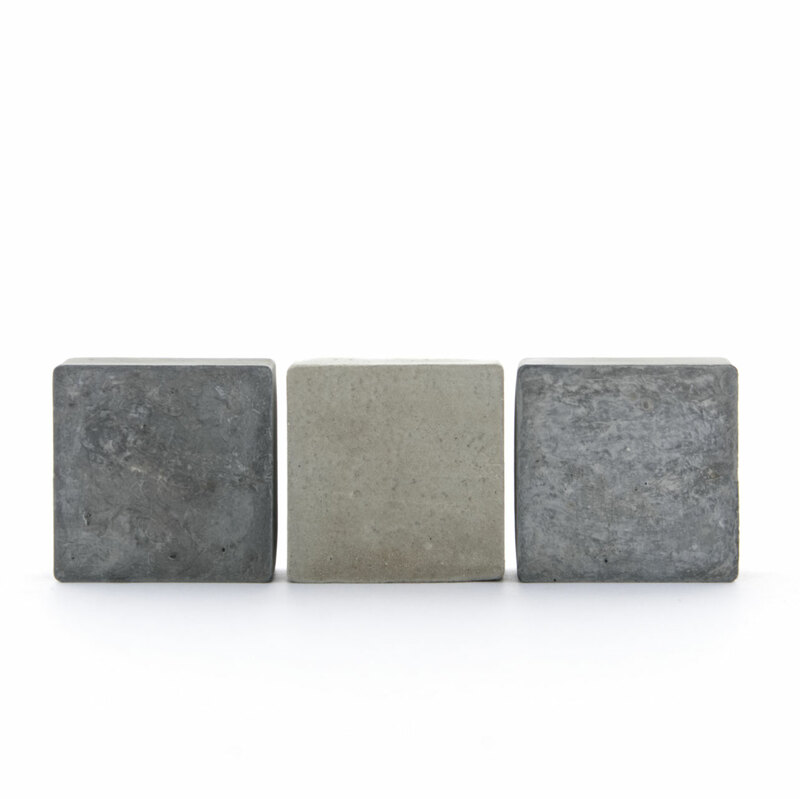 The smooth finish of the raw concrete is unique allowing you to create beautifully trendy backdrops using this modular set. 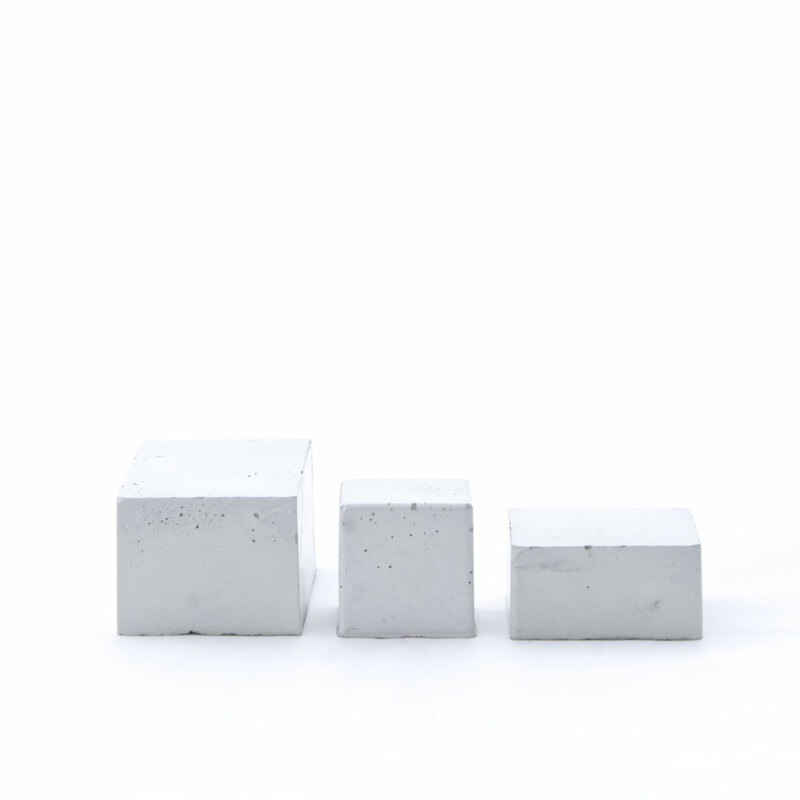 A set of three concrete blocks. 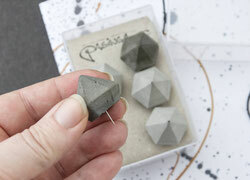 Depending on how you choose to display them they will be rectangular or square shaped prisms in pale and dark grey. 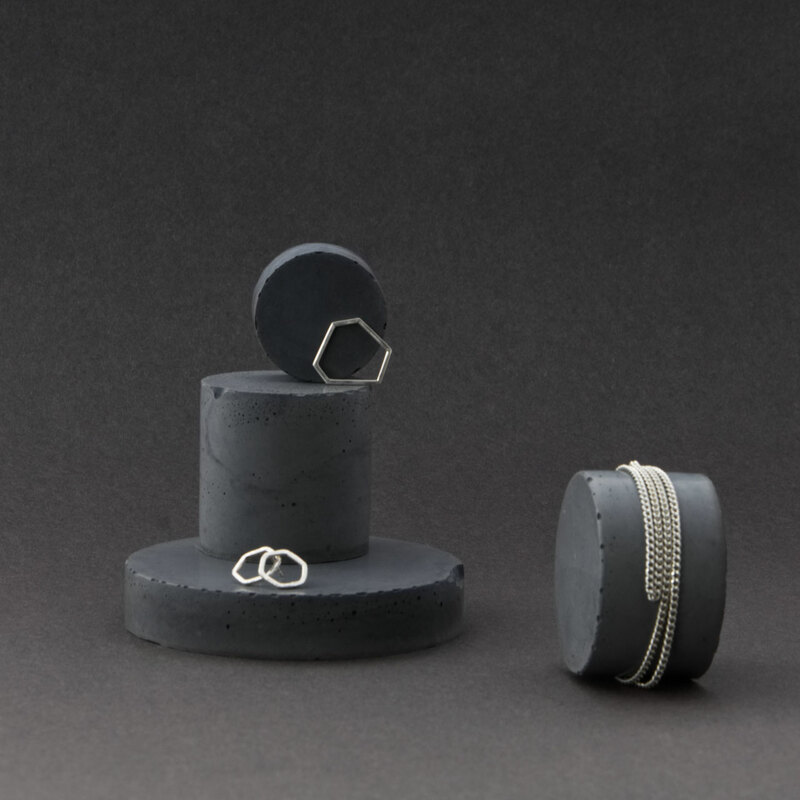 They are finished fairly smooth and allow you to stack them, line them up or create your very own unique modular sculpture before adding your jewellery or other smaller items. 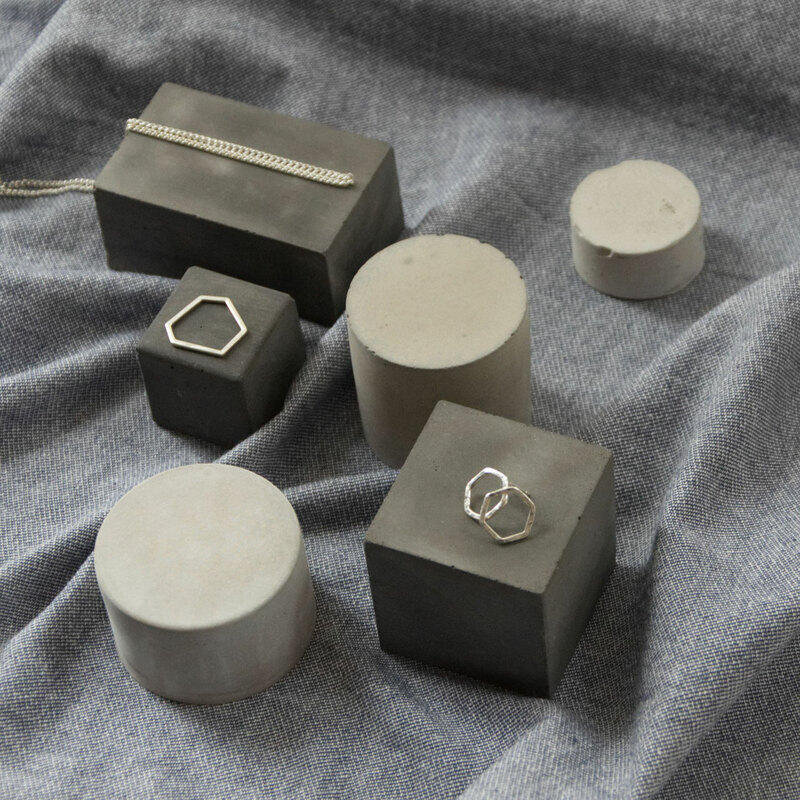 Let your products shine in-between these beautifully unique concrete finishes and create a trendy backdrop using these cool simple geometric concrete shapes. 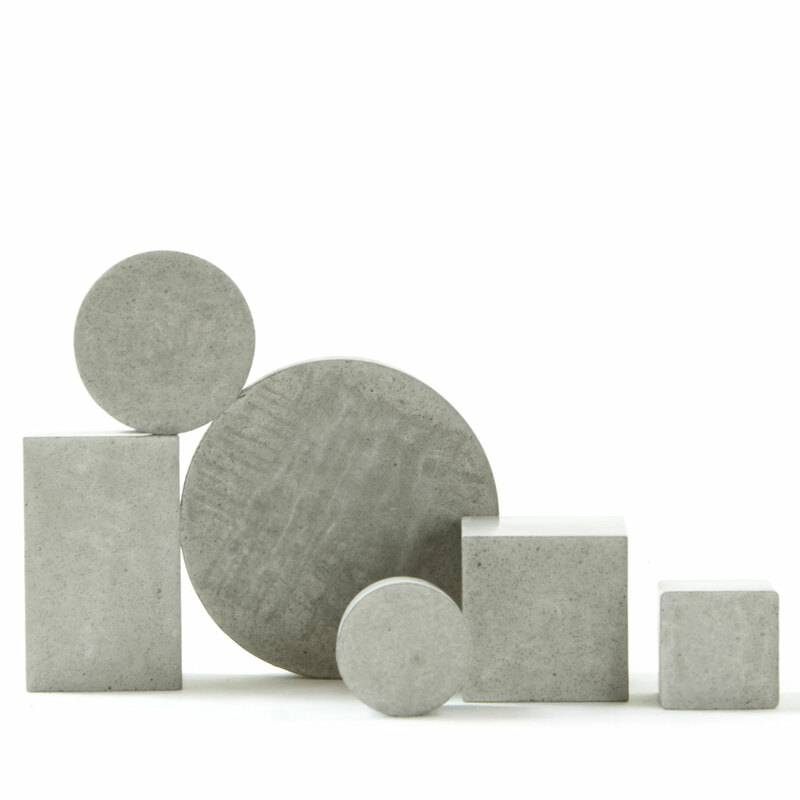 A set of four pure geometric shapes – made of pale grey concrete. Each sculpture solid features unique textures and imperfections. These simple but elegant forms provide the perfect backdrop for the display of anything shiny – like jewellery or pins. They are finished smooth and are very tactile. Have a play and display your objects in various modern ways by stacking or aligning the concrete prisms. 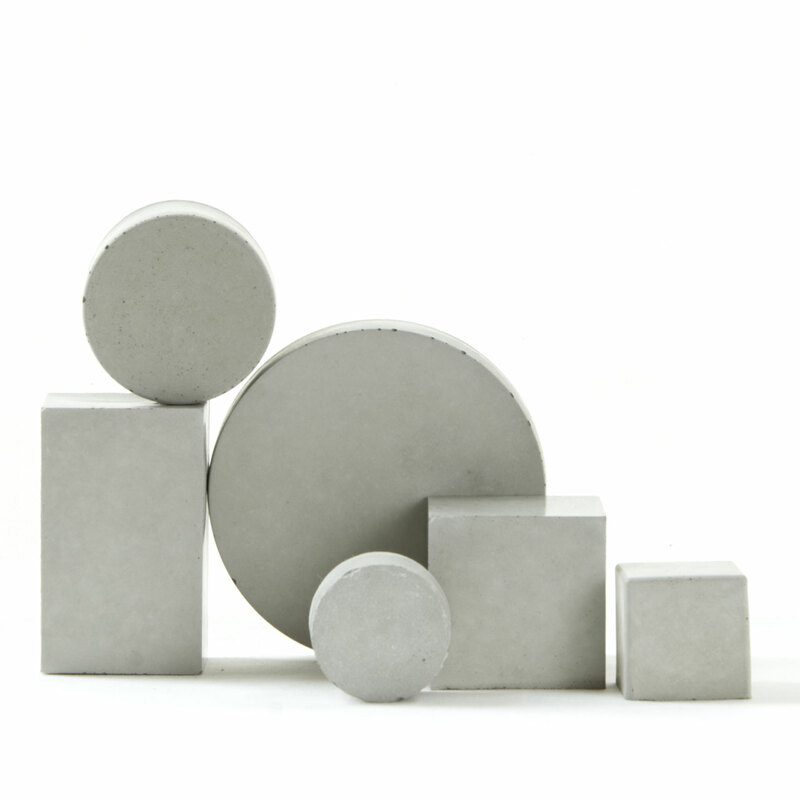 A modern concrete grey cube set of five smooth blocks. 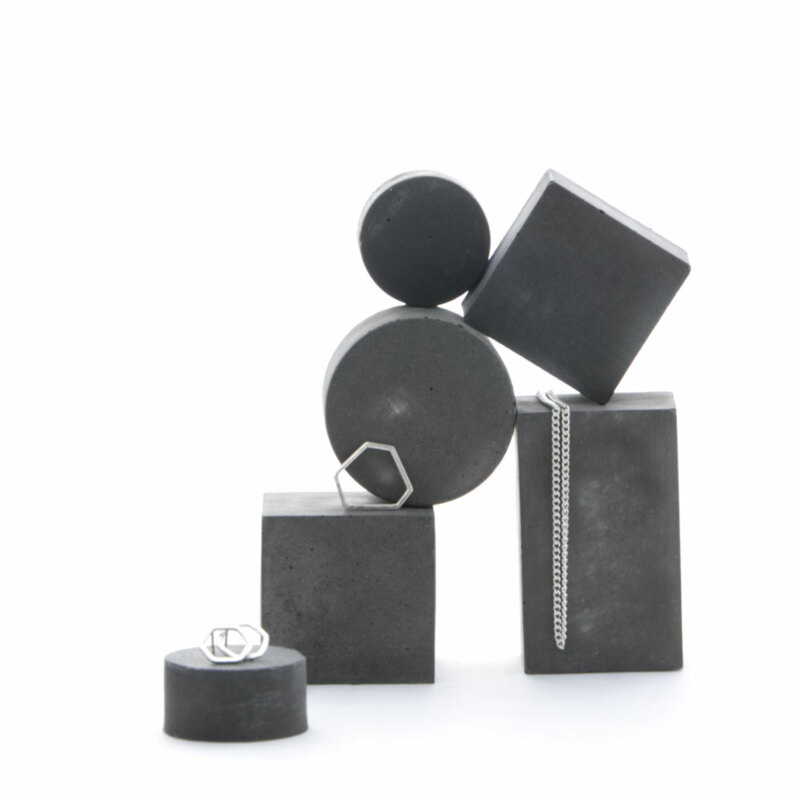 The sculpture solids are stackable in various ways or can simply be aligned to display jewellery or pins and other small items. 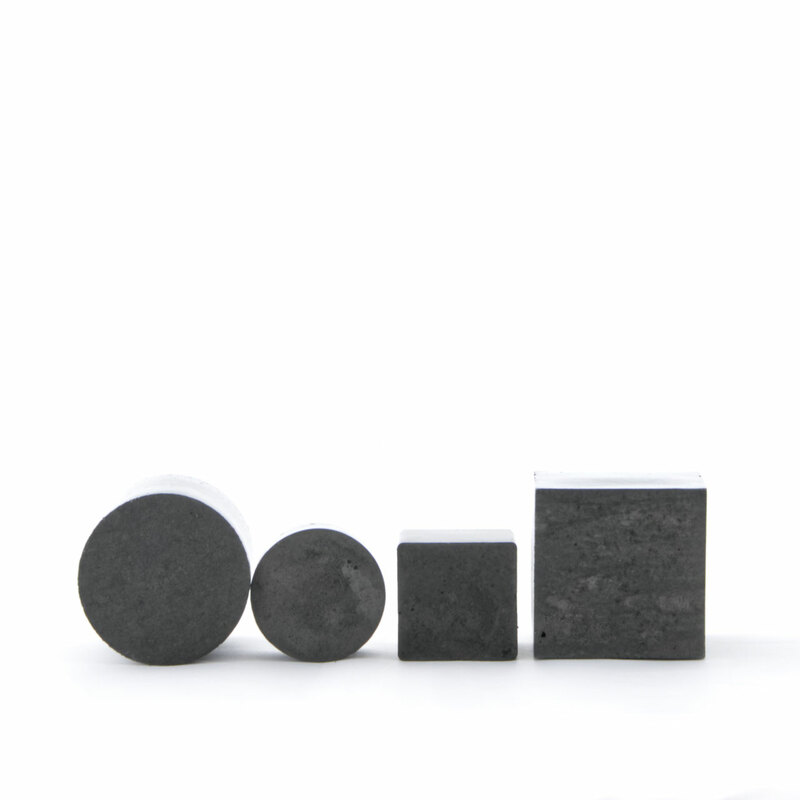 The set will help to create a modern backdrop at shows, exhibitions or for photoshoots. 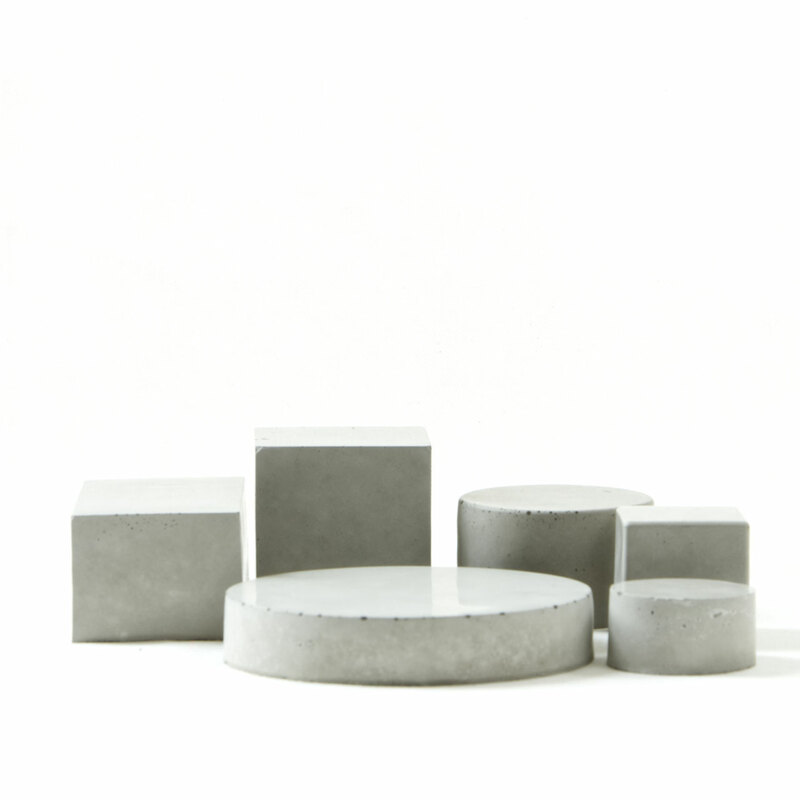 The raw material generates a unique finish every time and this set is no exception – each prism features stunning shades of pale grey concrete. 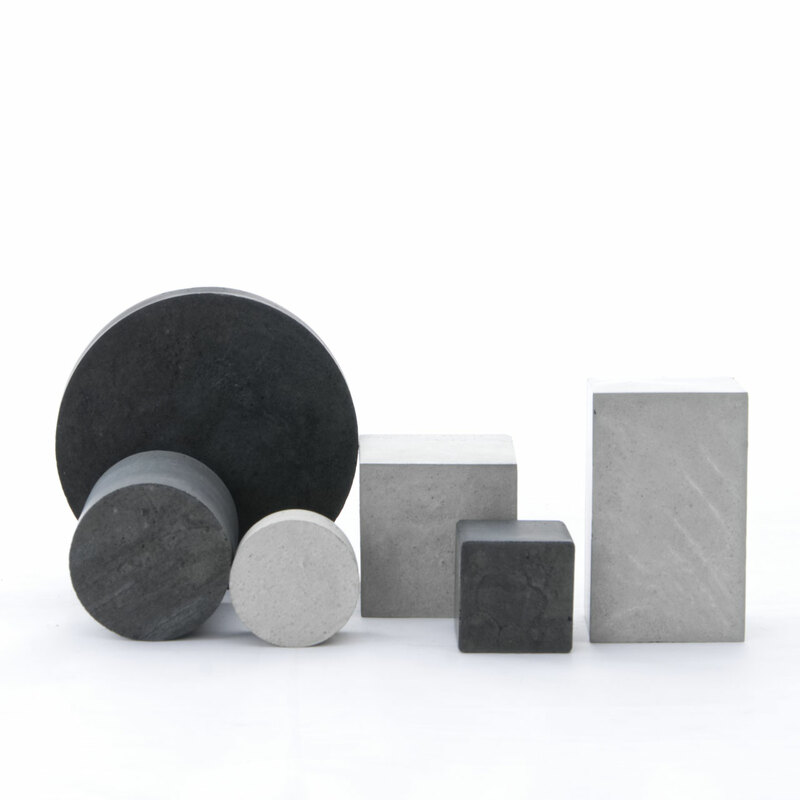 the images illustrate shape and sizes as well as the set displays in combination, however, the set shipped to your will feature unique shades of grey and imperfections. 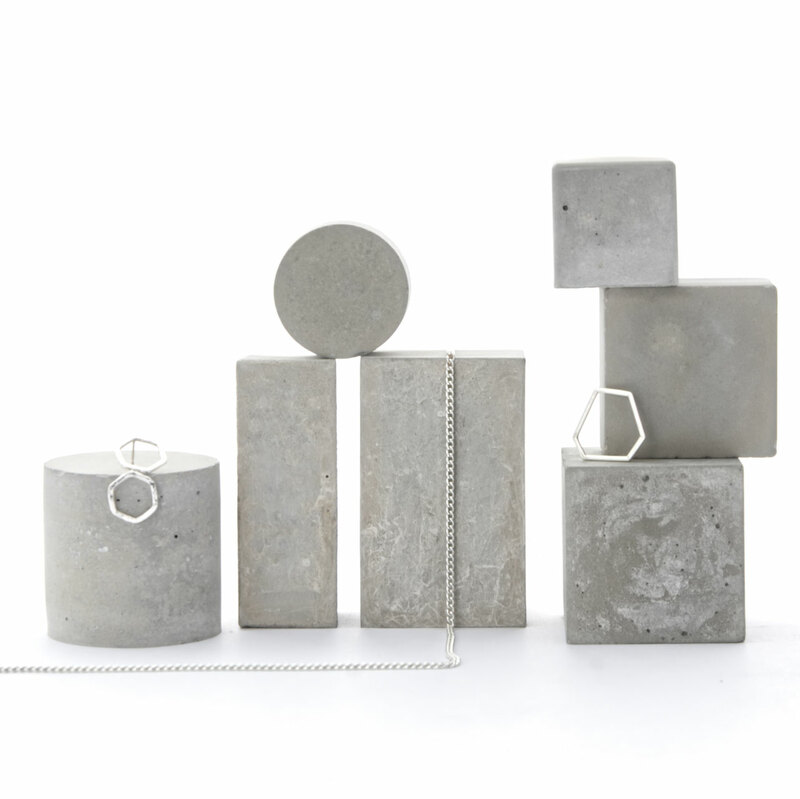 This combination of seven geometric concrete shapes provides you with endless combinations for your jewellery display, they are also unique props for shows, market fairs and photo shoots. The cylinders, cubes and rectangles of various sizes provide endless stacking and display opportunities which will let your products shine. 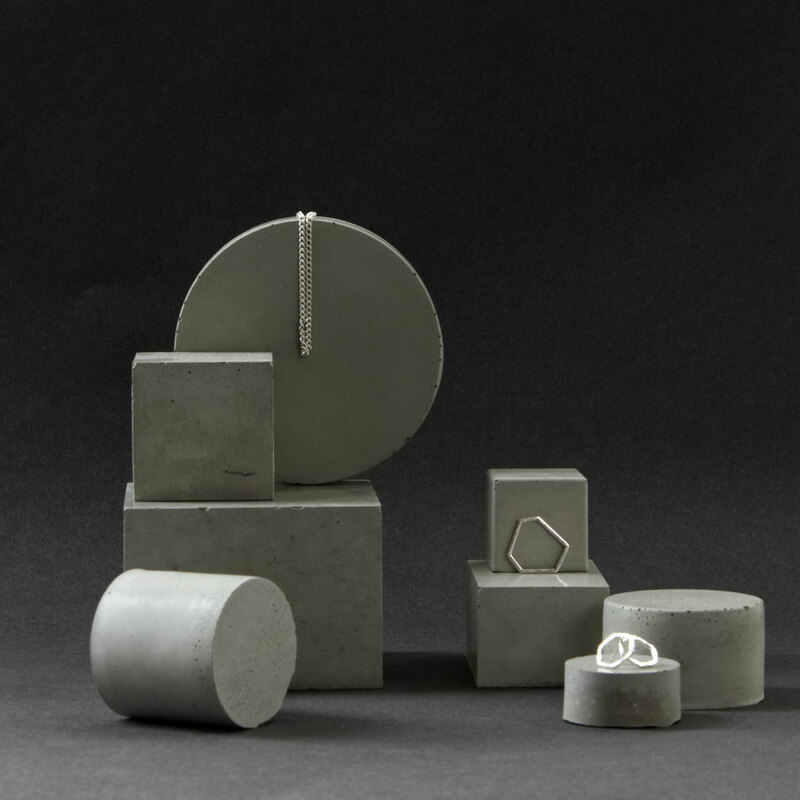 The raw material generates a unique finish every time and this set is no exception – each prism features stunning shades of pale grey concrete. the set pictured is to illustrate shape and size of each solid and how they display together, however, the set shipped to you will feature unique pale grey shades and imperfections. 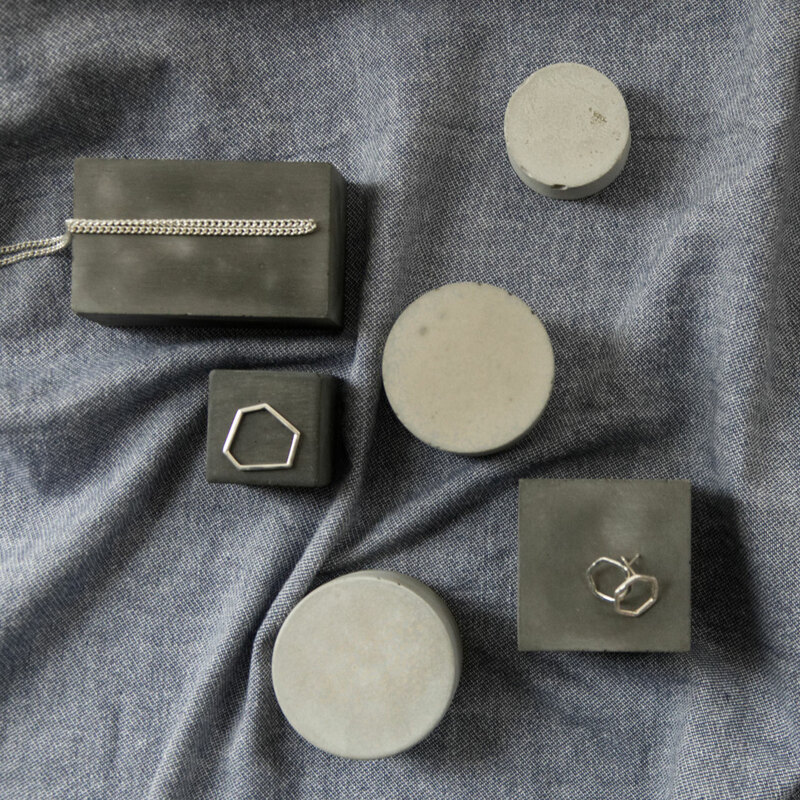 Create unique and minimal displays using these raw concrete sculpture solids finished in smooth shades of dark grey. 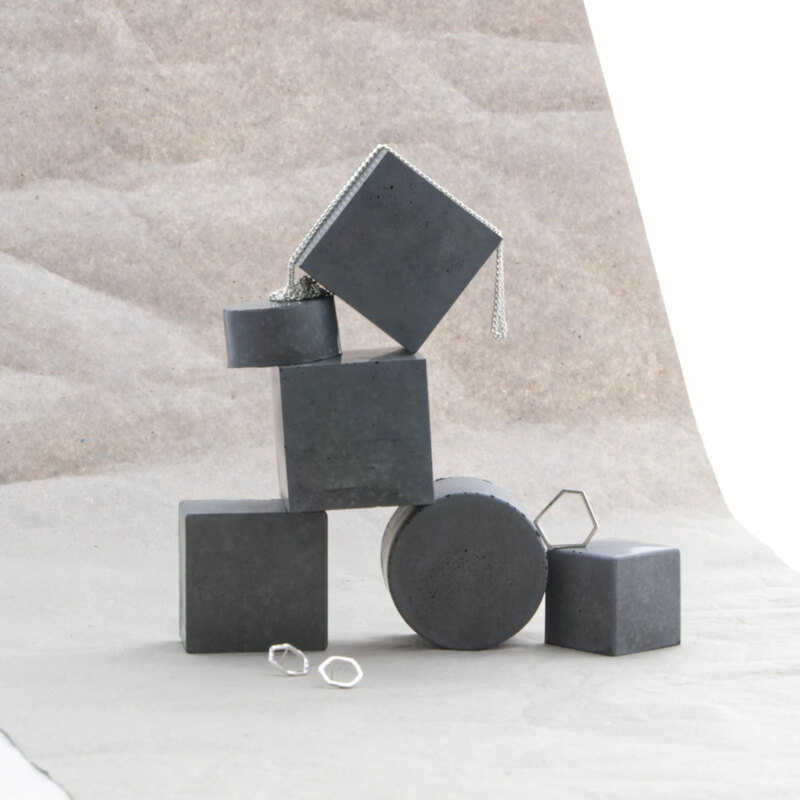 These cubes, rectangles and cylinders can be stacked and aligned for editorial photoshoots and exhibition product displays or simply arranged to form the base for your jewellery market stand. 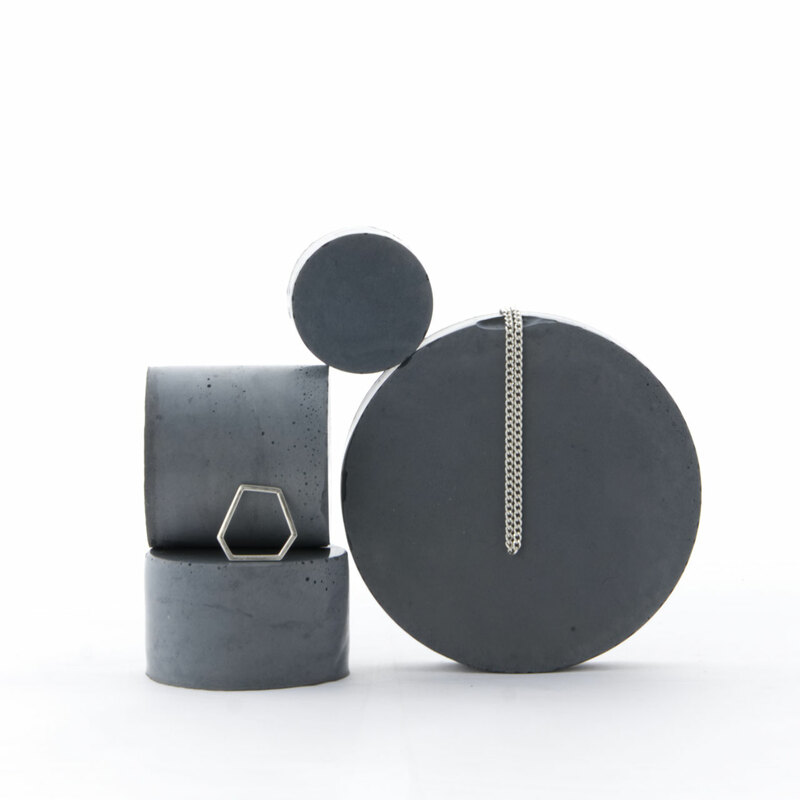 Create contrast to these individually hand crafted raw concrete volumes with your pins, jewellery or small cosmetic designs. 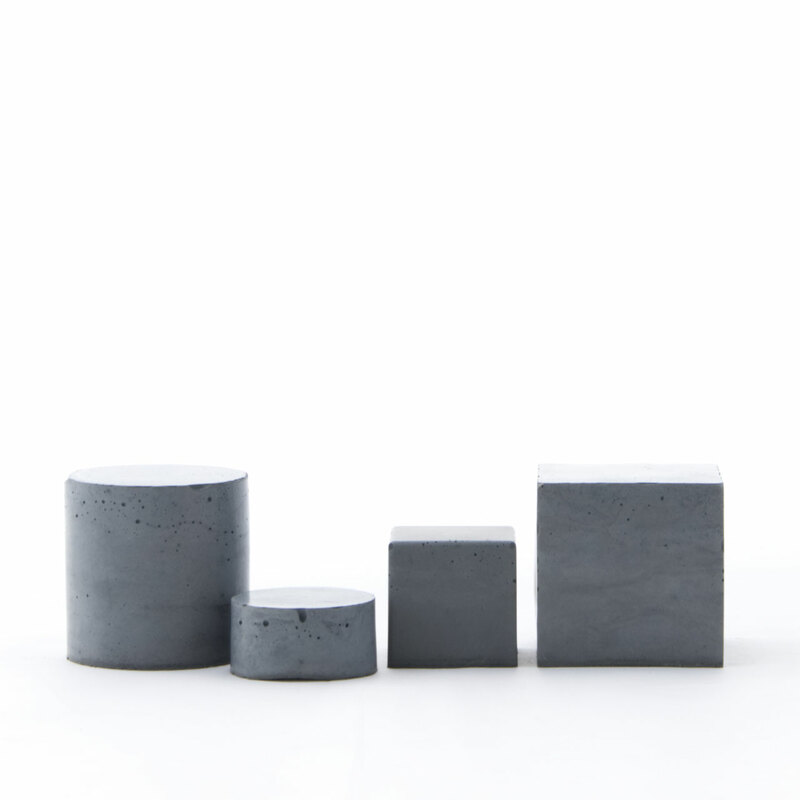 A set of 6 small concrete cylinders in a mix of charcoal to dark grey shades. 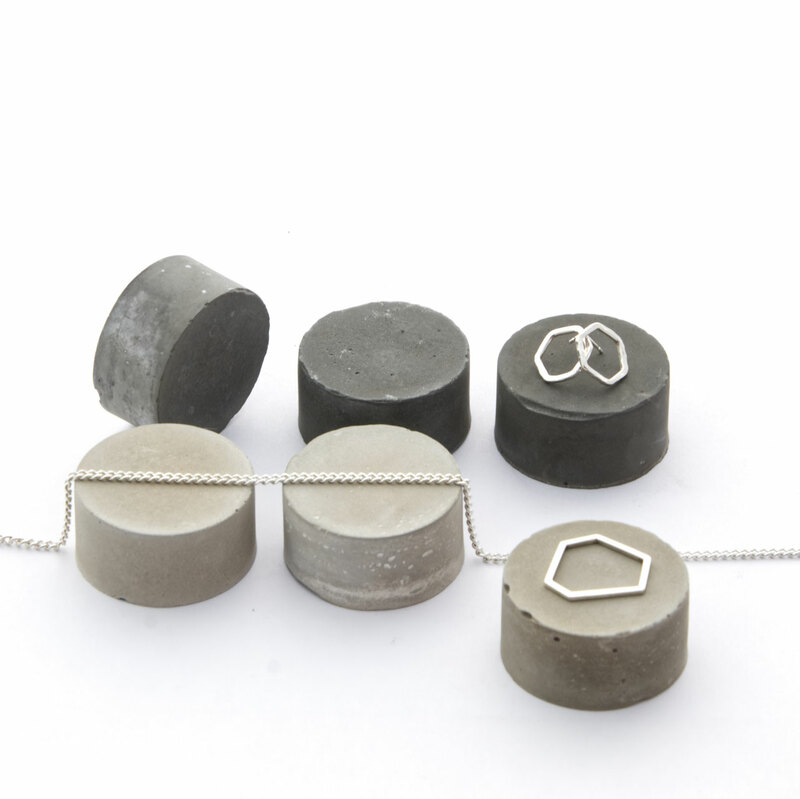 Stack them, roll them, align them and add your jewellery or pins. 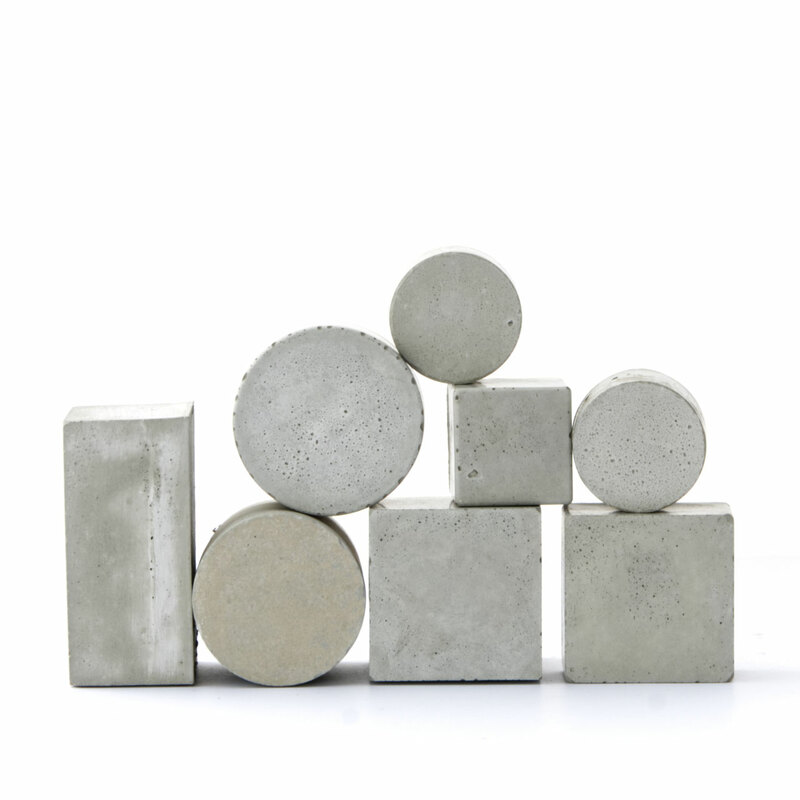 This raw geometric concrete set allows you to create beautiful displays at market fairs or exhibitions and provides a stark contrast to especially glossy items you might intend to display. 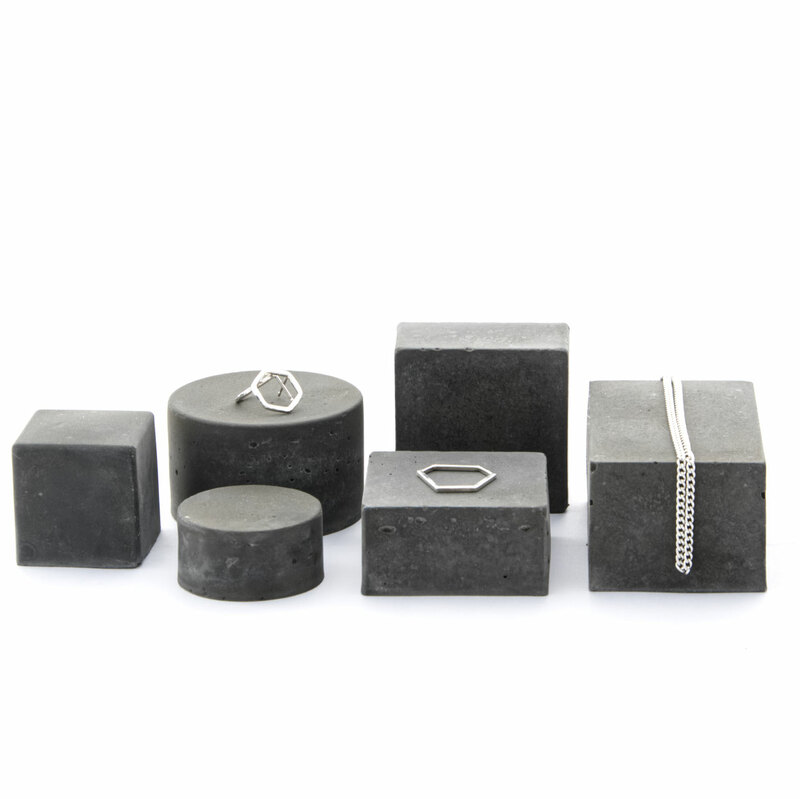 The smooth finish of the tactile concrete is unique and ranges from charcoal to dark grey in this beautifully trendy stackable set. 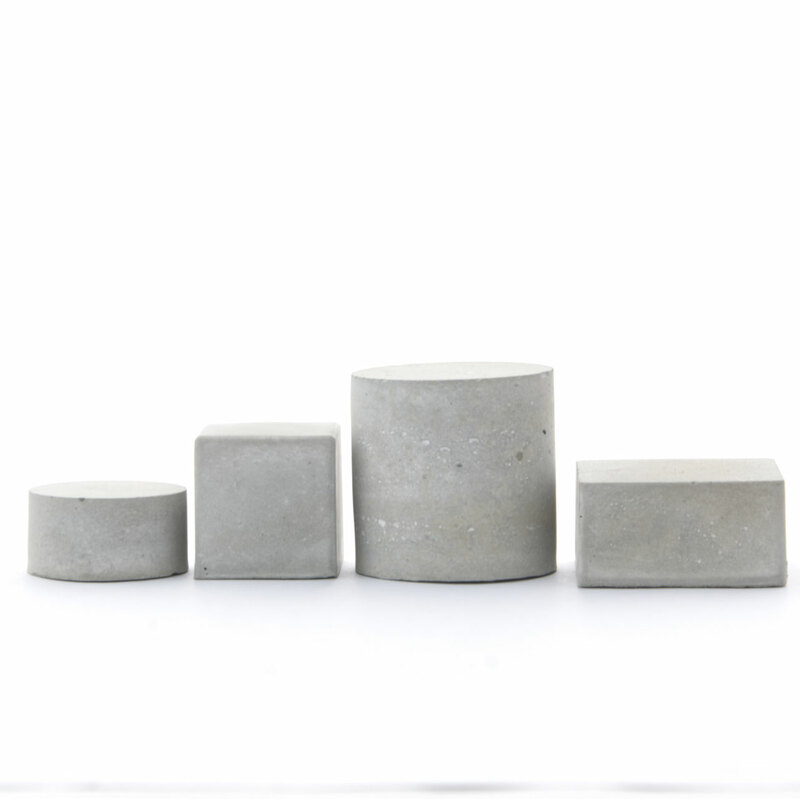 Four extraordinary geometric sculpture solids in aged pale grey concrete to create sculpture stills or to utilise as photo styling prop. The shape of the cuboctahedron and icosahedron is very fanciful and offers wonderful options to display them as sculpture still. The aged concrete surface is very smooth, unique shades of grey and 'marble' effects have occurred. You will be able to stack and align them on many sides but as the first two pictures illustrate, and since each solid is a sculpture in itself, you wont need much to create eye-catching styles on your market stall or within your exhibition or retail display. 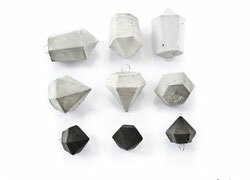 A modern geometric concrete prism set of 8 sculpture solids. 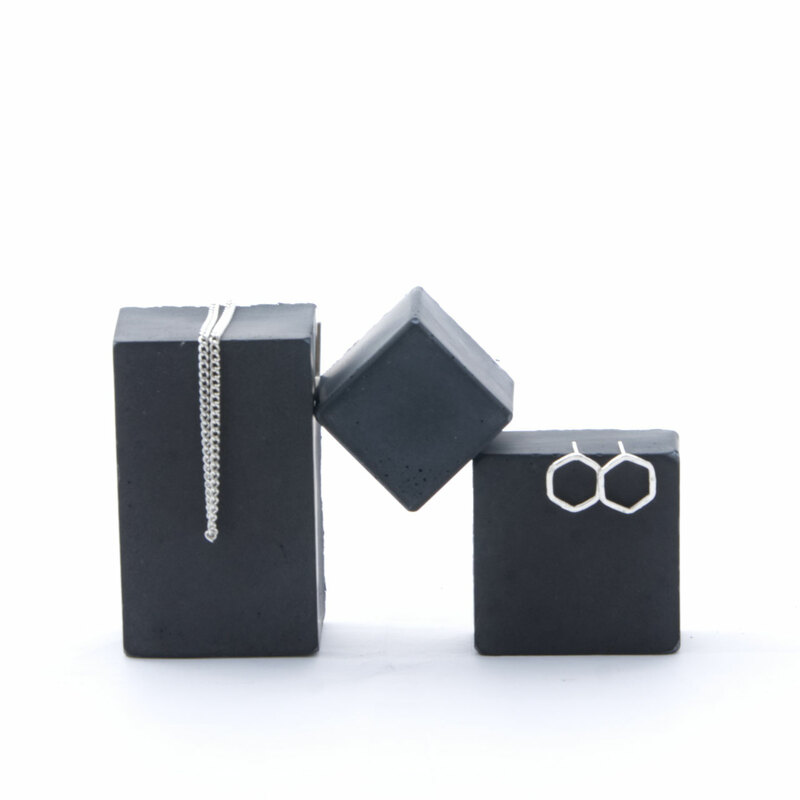 The sculpture solids of cubes, rrectangular prisms and various cylinders are stackable in different ways or can simply be aligned to display jewellery or pins and other small items. 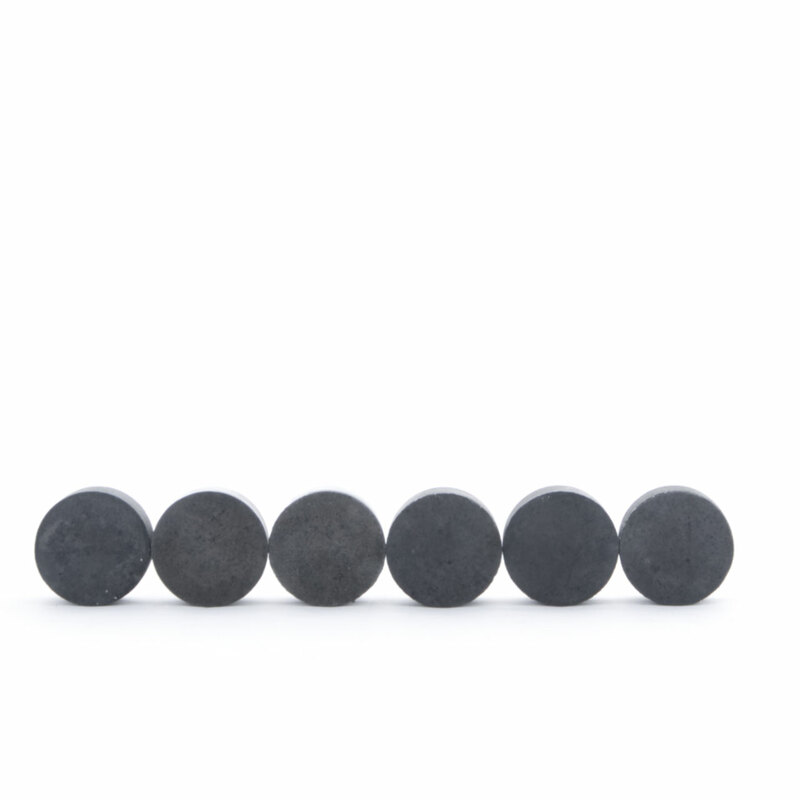 This set could create a modern backdrop at shows, exhibitions or window displays. 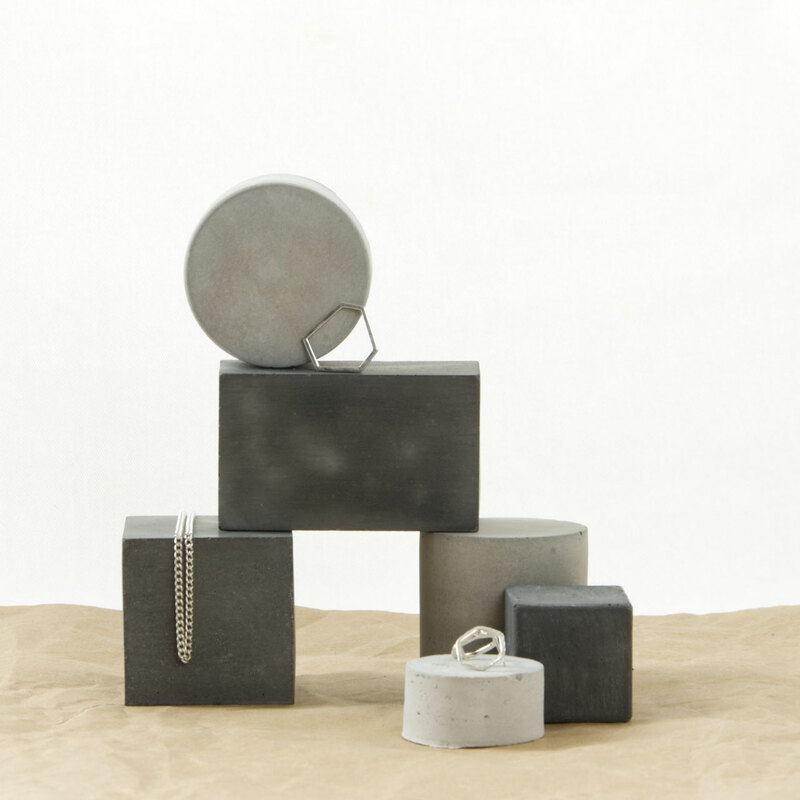 The raw material generates a unique finish every time and this set is no exception – each prism features stunning shades of pale grey concrete which is a wonderful contrast for editorial photo shoots. the set pictured provides proportions and shape of the solid however the grey shade and imperfections of the set shipped to you will be unique. 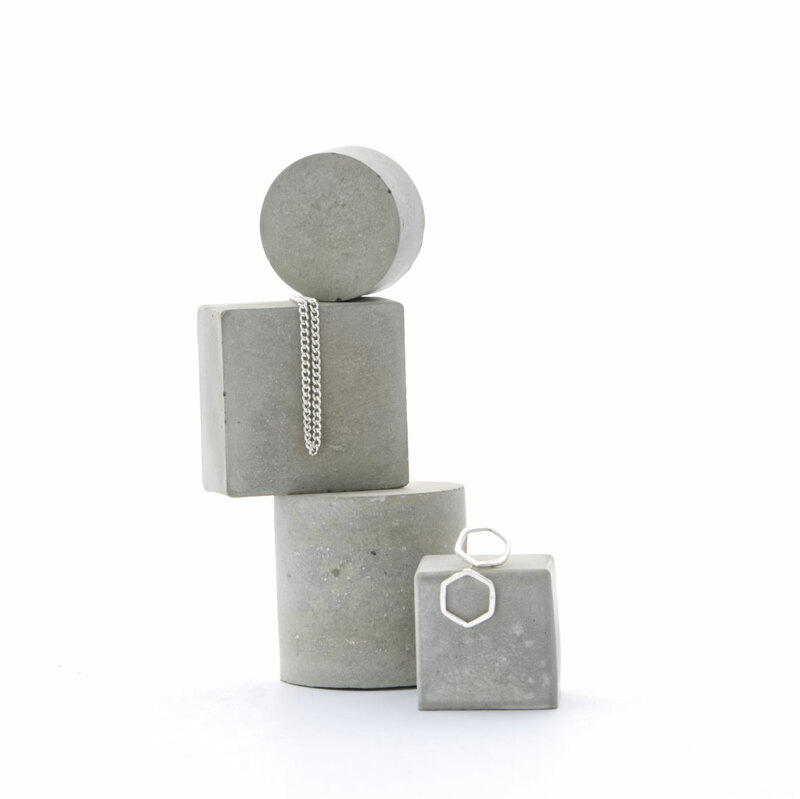 A delightful mid to pale grey geometric concrete modular jewellery display set. 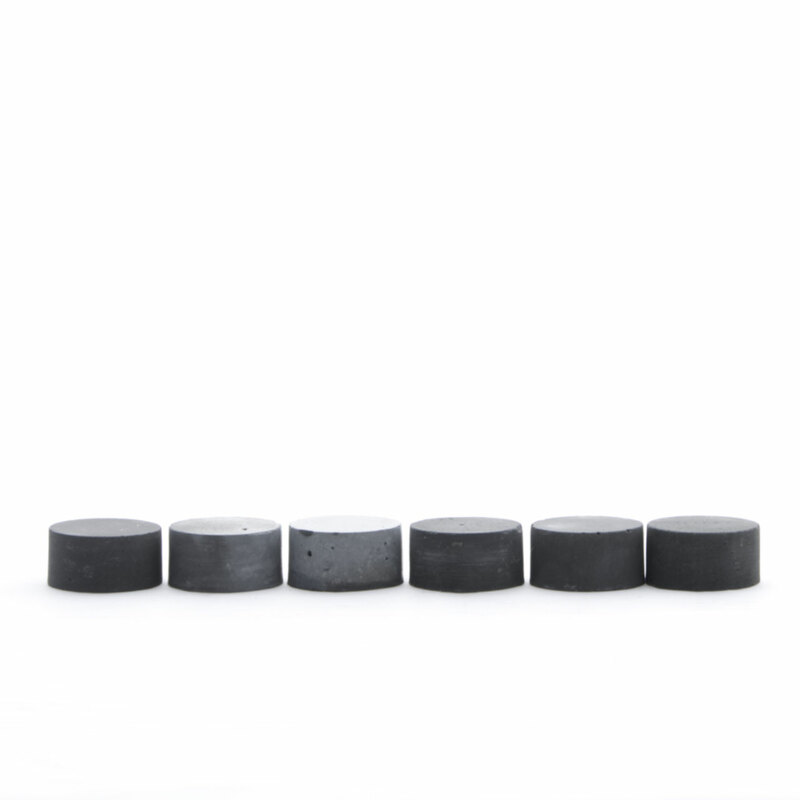 This set features 4 different sculpture solids with unique textures and imperfections. These simple but elegant cubes and cylinders provide the perfect backdrop for the display of anything shiny – like jewellery or pins. They are finished smooth and are very tactile. 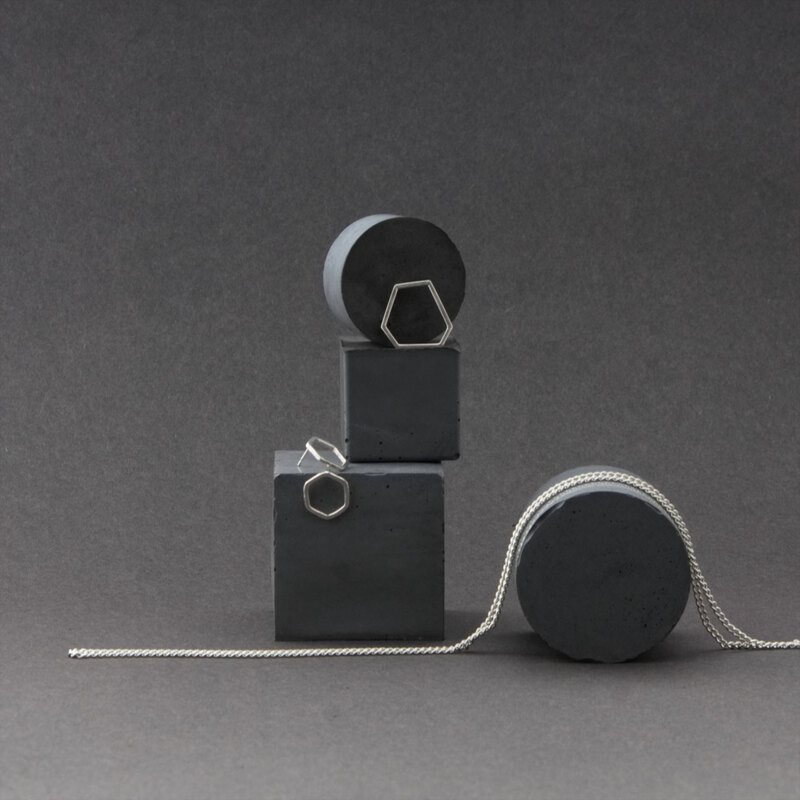 Have a play and display your objects in various modern ways by stacking or aligning the concrete prisms for your exhibition, photoshoot or retail displays. 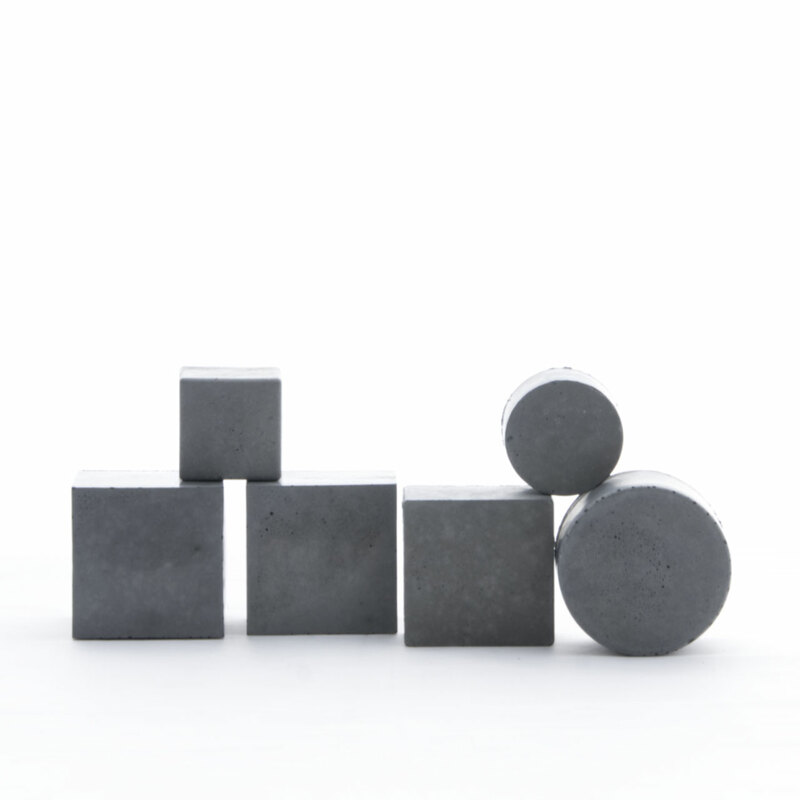 Create unique and minimal sculpture stills or utilise the mostly charcoal grey concrete blocks to create unique displays. 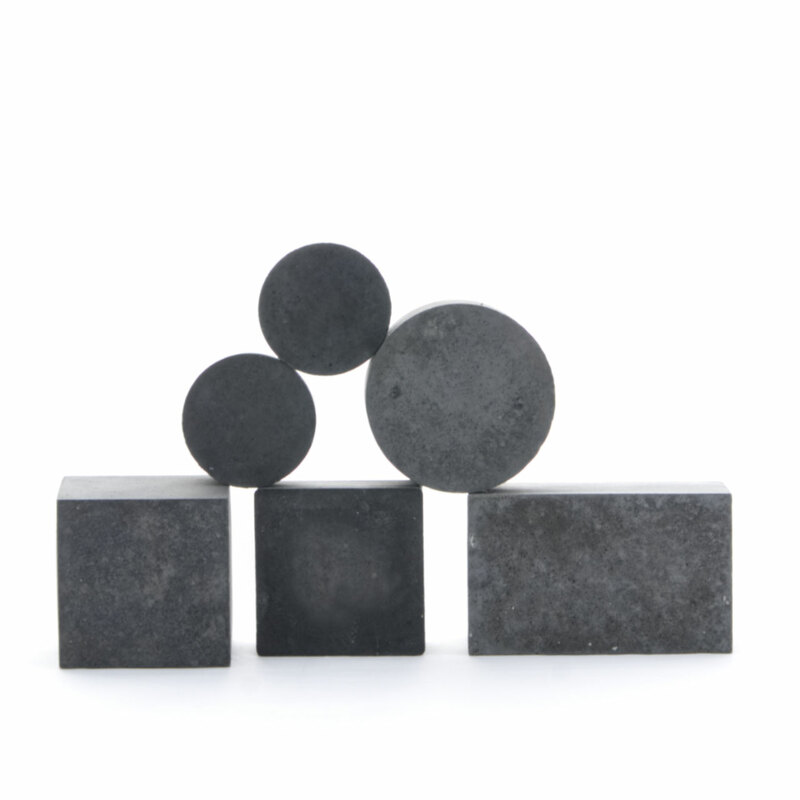 The set of 6 geometric concrete sculpture solids is finished in shades of charcoal and dark grey. 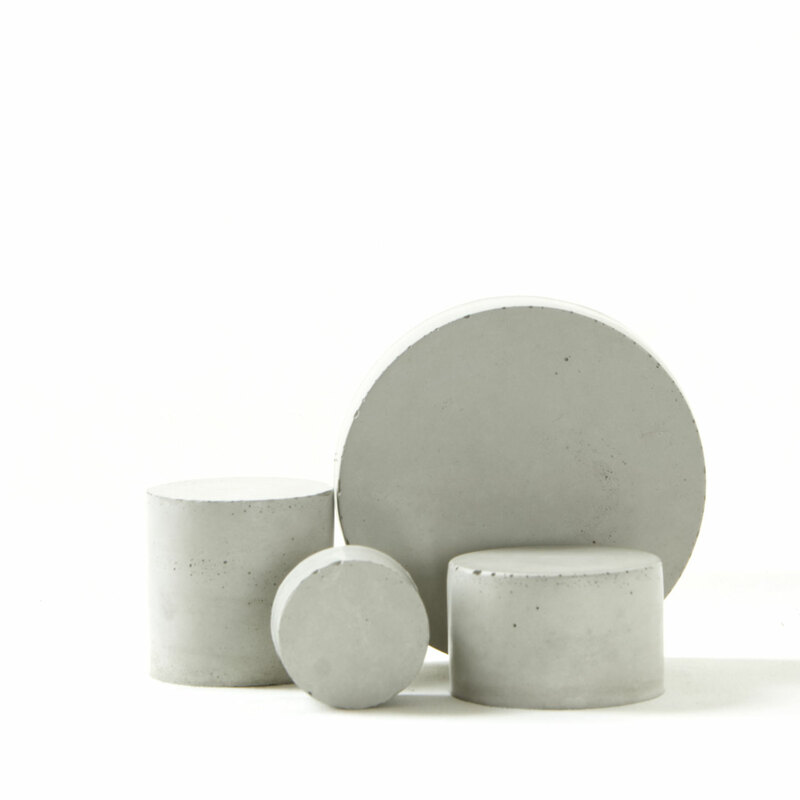 Most sides feature an almost glossy surface, reflecting light and pale objects but one side of each solid is matt and in a darker grey. 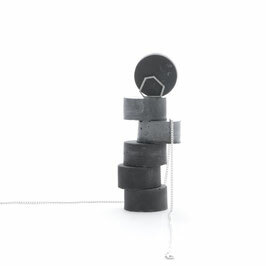 These cubes, rectangles and cylinders can be stacked and aligned for editorial photo shoots, exhibition product displays or simply arranged to form the base of your jewellery market stand. 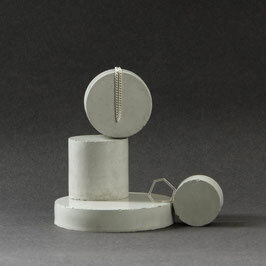 Create contrast to these individually hand crafted concrete volumes with your pins, jewellery or small cosmetic designs. 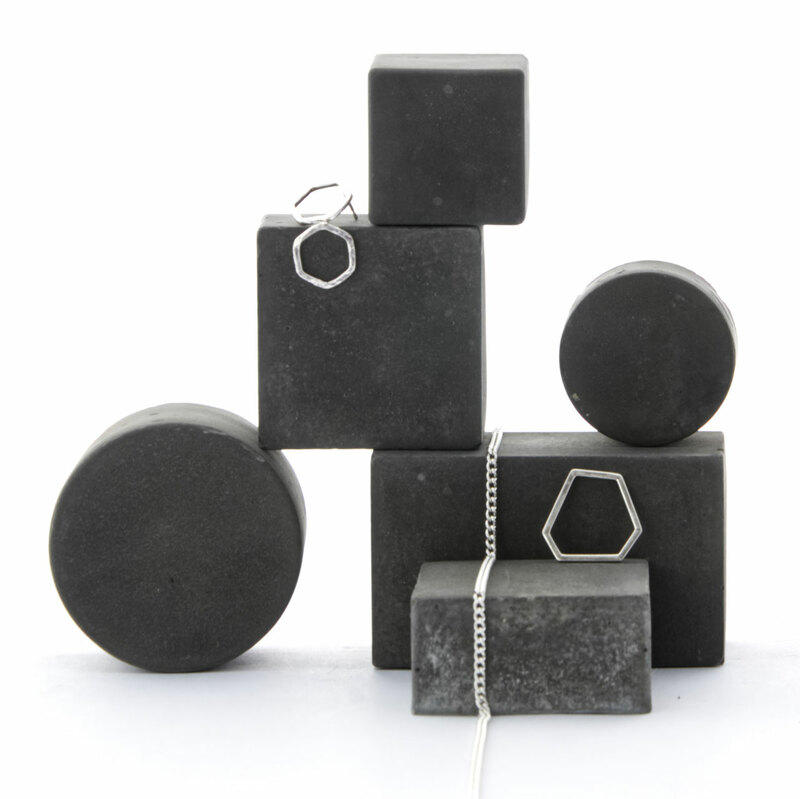 This monochrome geometric concrete cube and rectangular prism set of 5 sculpture solids offers various and stunning ways to display jewellery, pins and other small items like cosmetics. 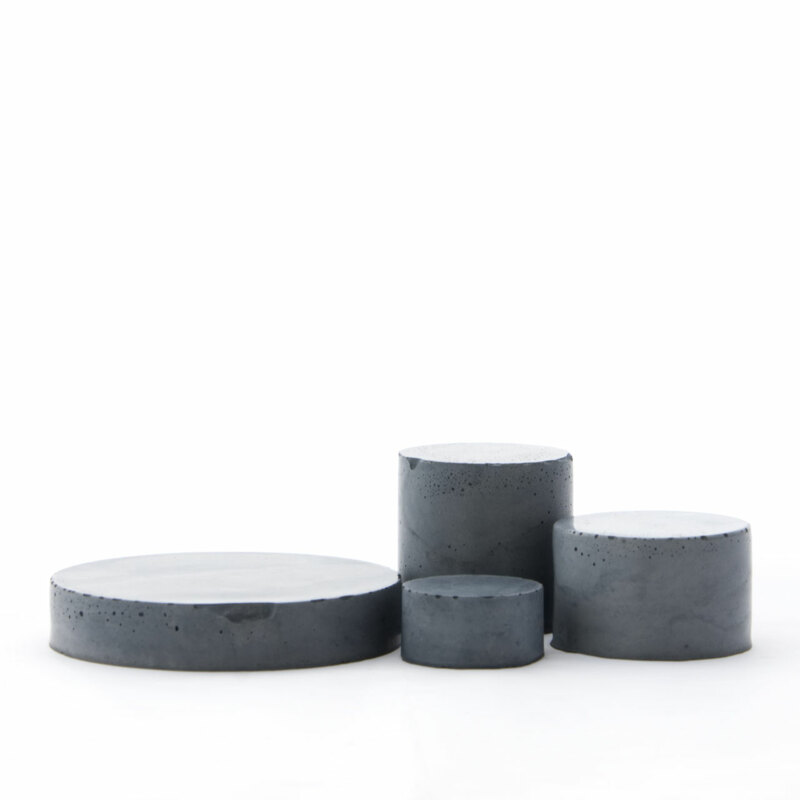 Create a stark or smooth contrast by playfully using the multiple shades of dark to pale grey concrete and combinations this set has to offer. 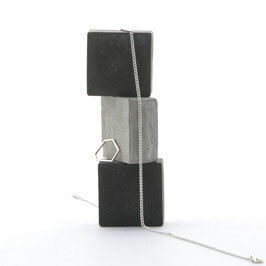 The sculpture solids of cubes and rectangular prisms are stackable in many ways or can simply be aligned. This set could create a modern backdrop at shows, exhibitions or window displays but could also be the prop for editorial photo shoots. 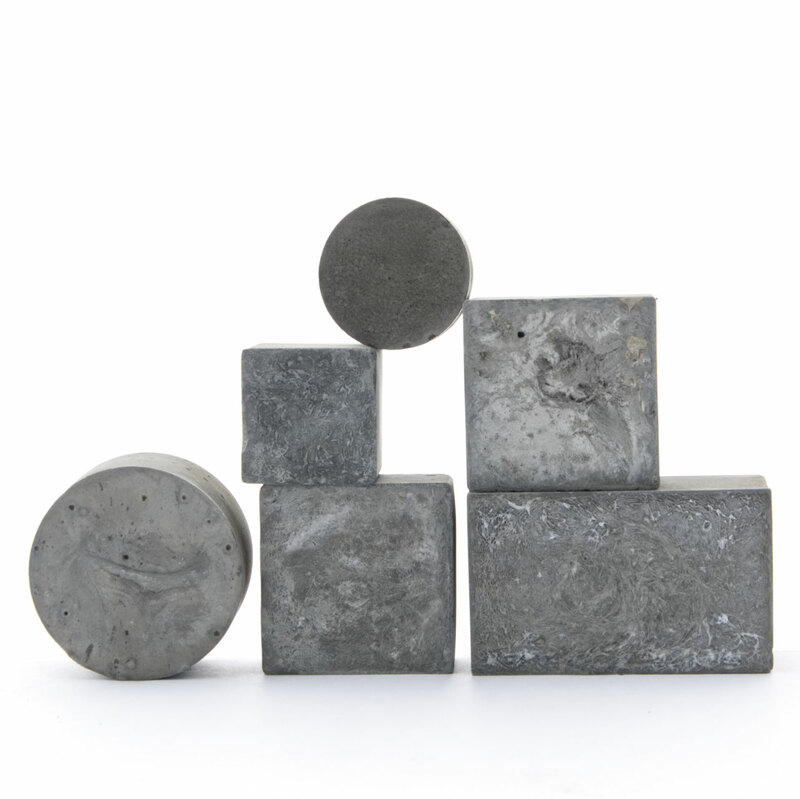 The raw material generates a unique finish every time and each solid features unique imperfections and shades of grey concrete. 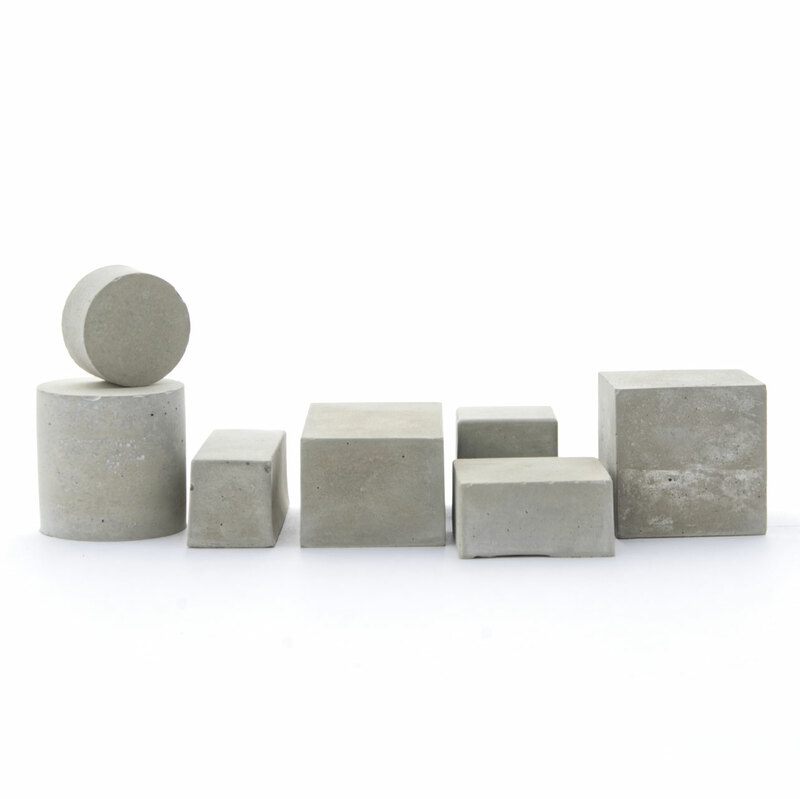 A delightful mid to pale grey geometric concrete modular block set. 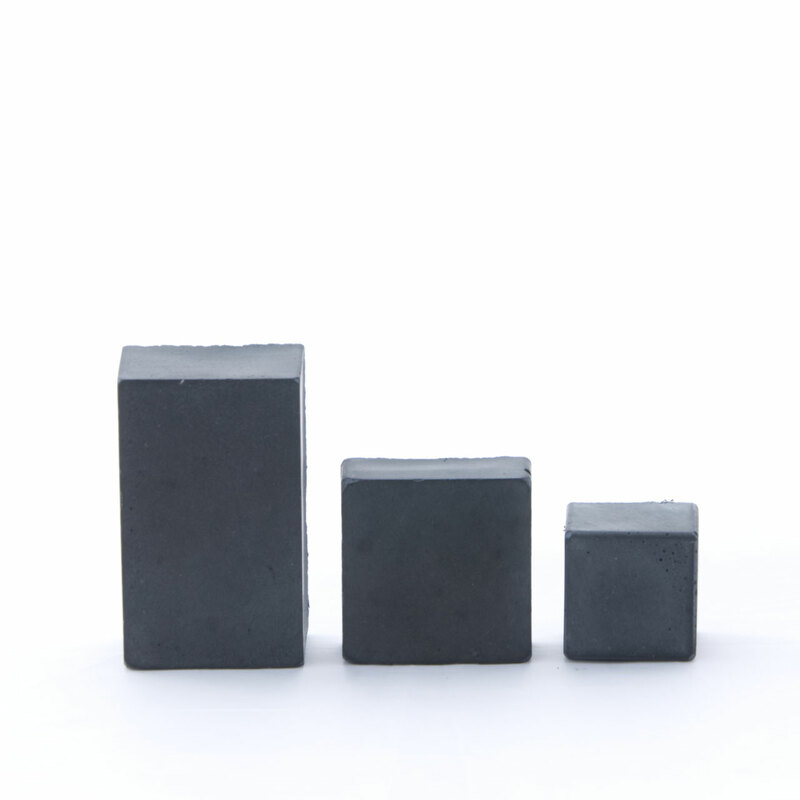 This set features 4 different sculpture solids of cube, rectangular prism and two cylinders with unique textures and imperfections. It is a rather rustic, edgy set offering countless contrasts. 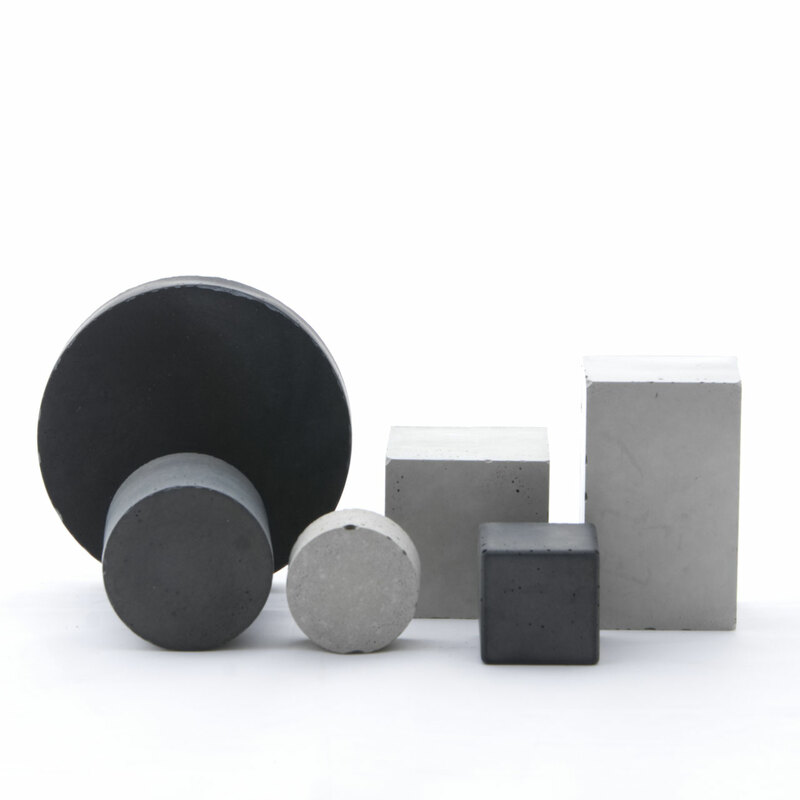 While the overall feel is smooth each solid also offers deep textures. 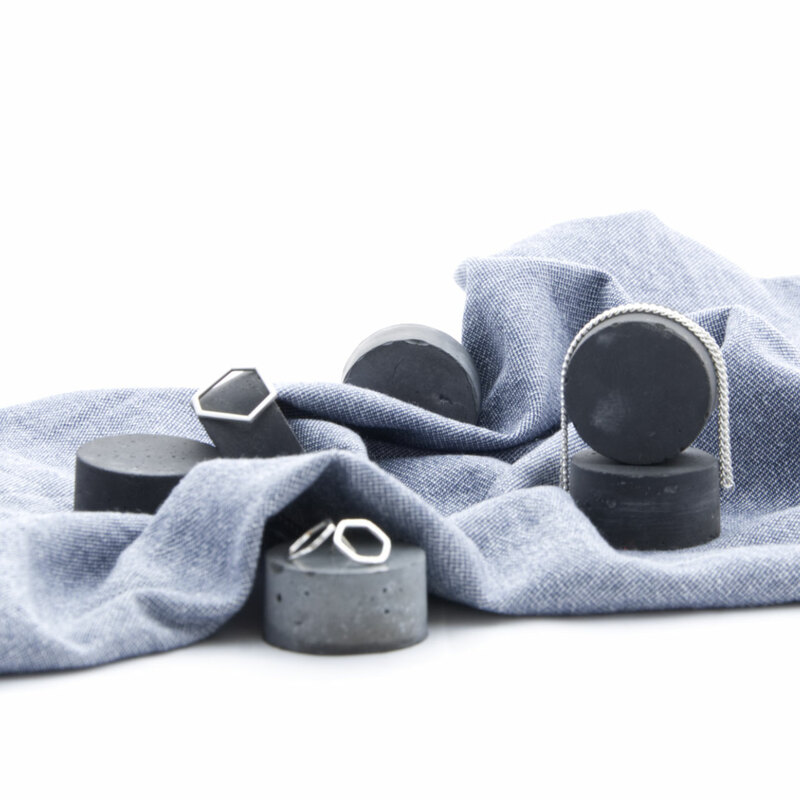 These simple but elegant cubes and cylinders provide the perfect backdrop for the display of anything shiny – like jewellery or pins. 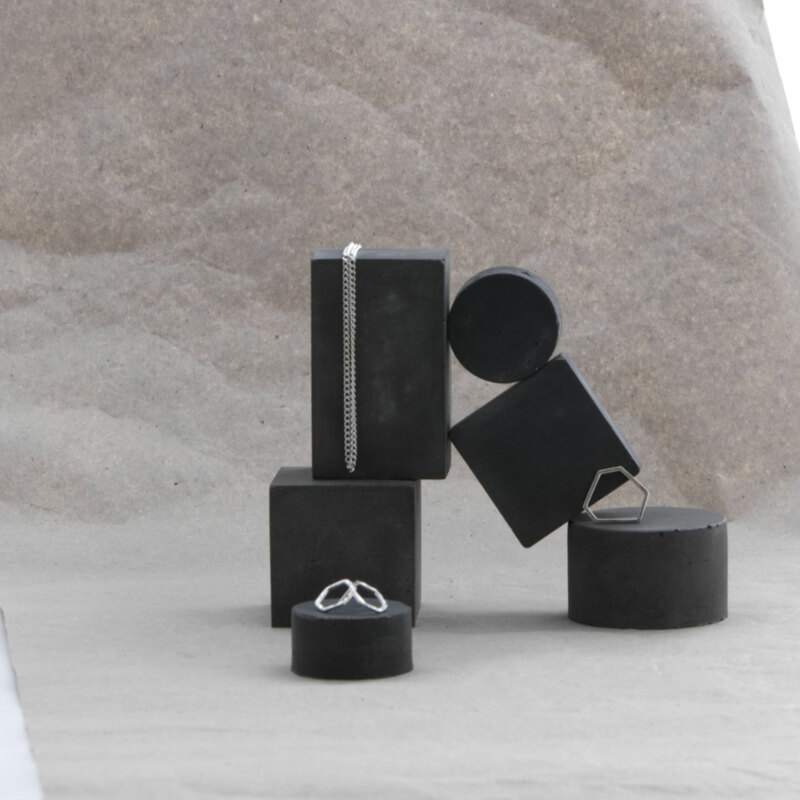 Have a play and display your objects in various ways by stacking or aligning the concrete prisms for your exhibition, photo shoot or retail displays. Tip: While jewellery and other props are not included you could purchase the Reindeer Moss here. 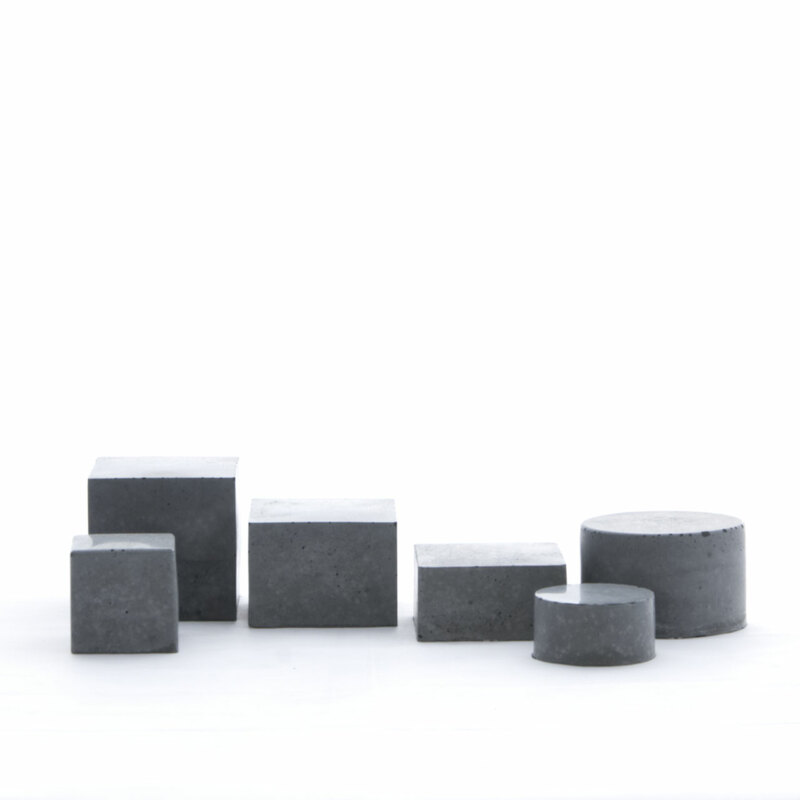 A modern geometric concrete prism set of 6 monochrome sculpture solids. 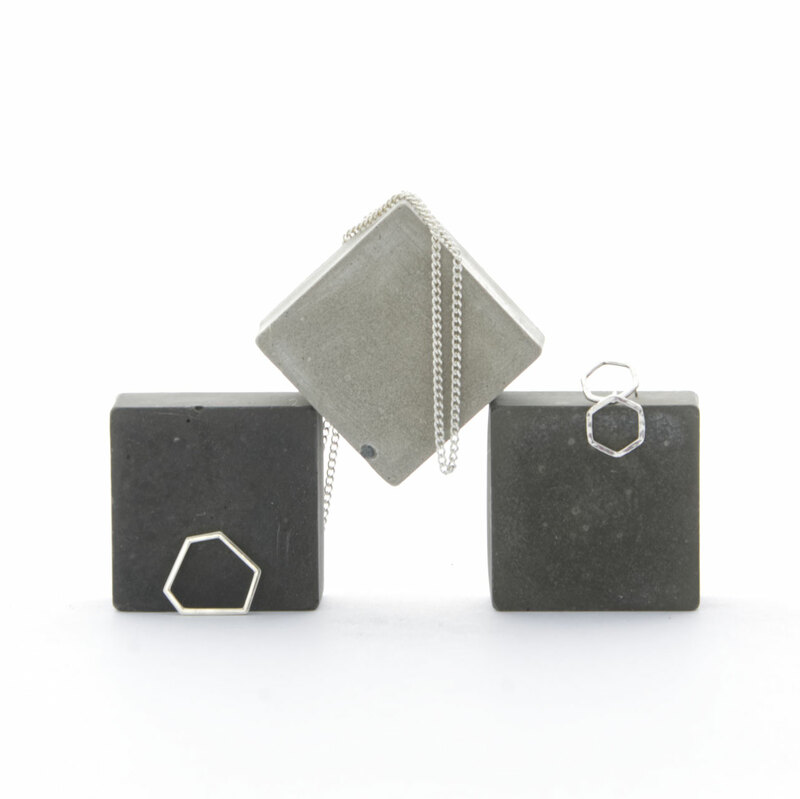 The geometric prism set features cubes and rectangular prisms in various sizes. 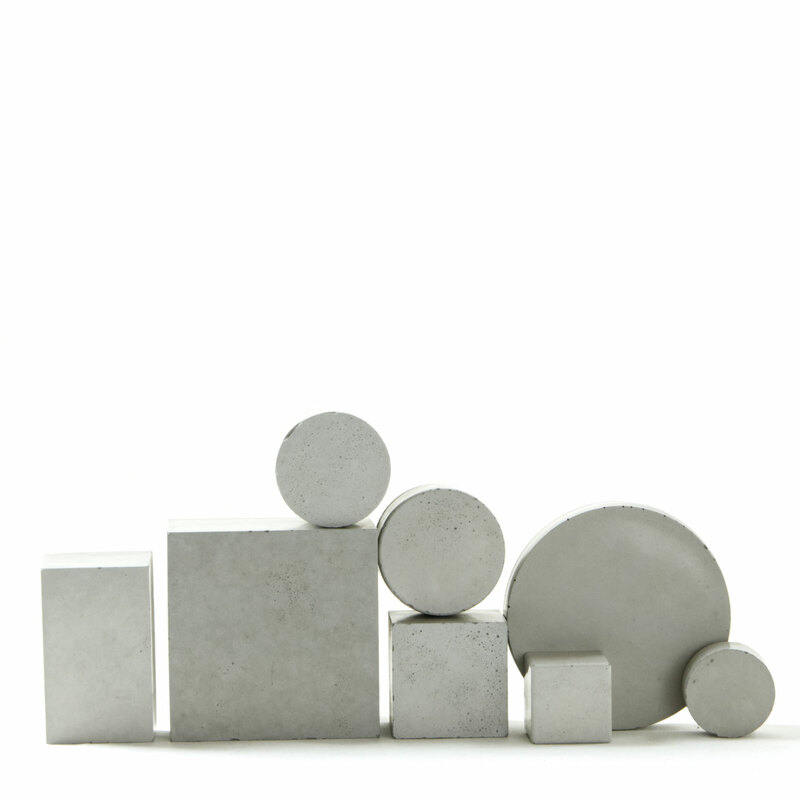 The solids are stackable in different ways or can simply be aligned to display jewellery, pins and other small items. 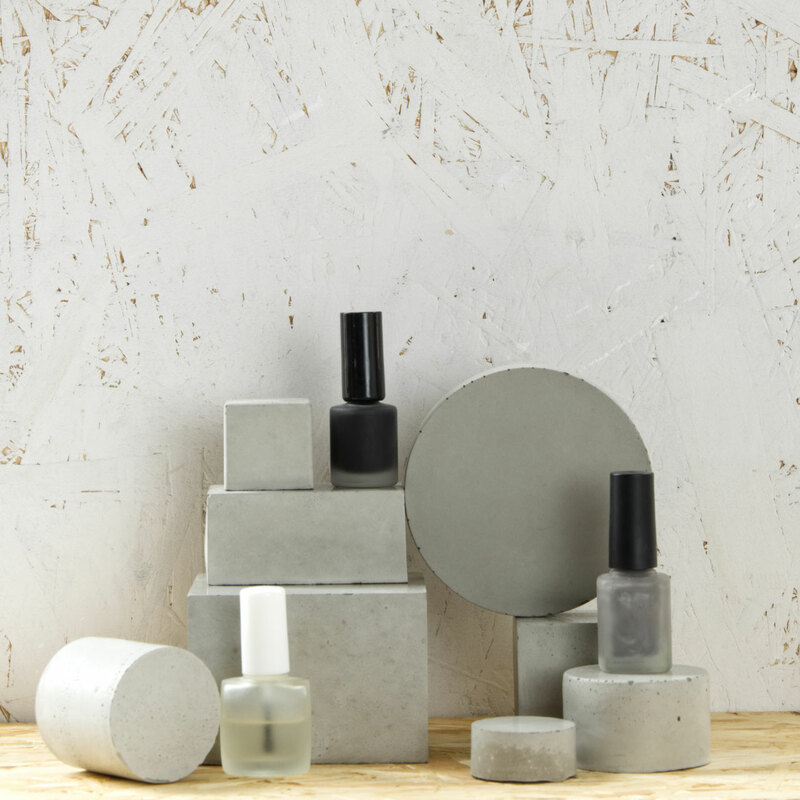 The raw material generates a unique finish every time and this set is no exception – each prism features stunning shades of pale, mid and dark grey concrete which is a wonderful contrast for editorial photo shoots. 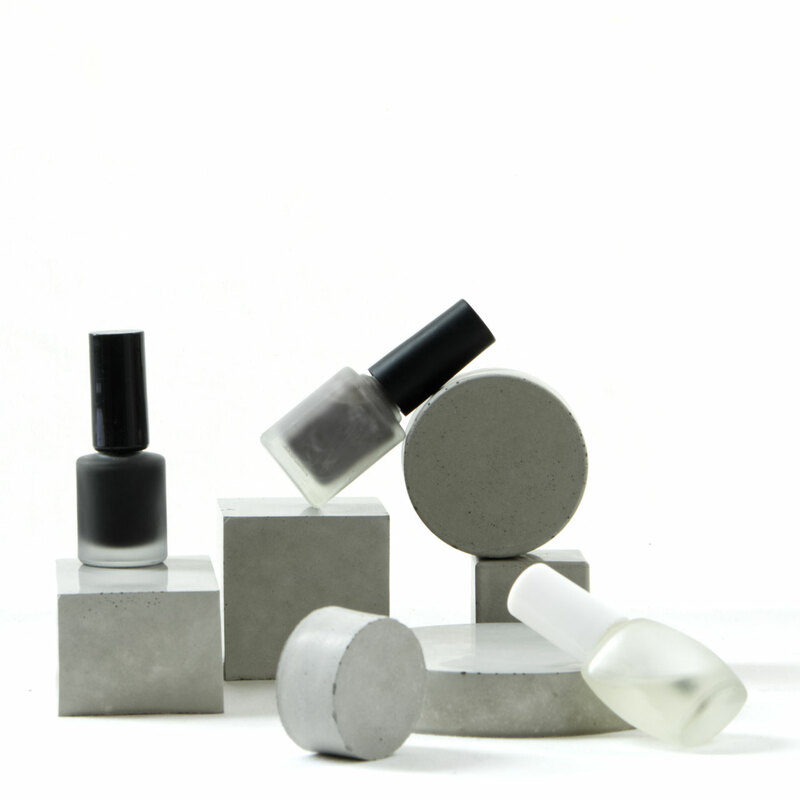 This monochrome geometric concrete prism set of 6 sculpture solids offers various and stunning ways to display jewellery, pins and other small items like cosmetics. 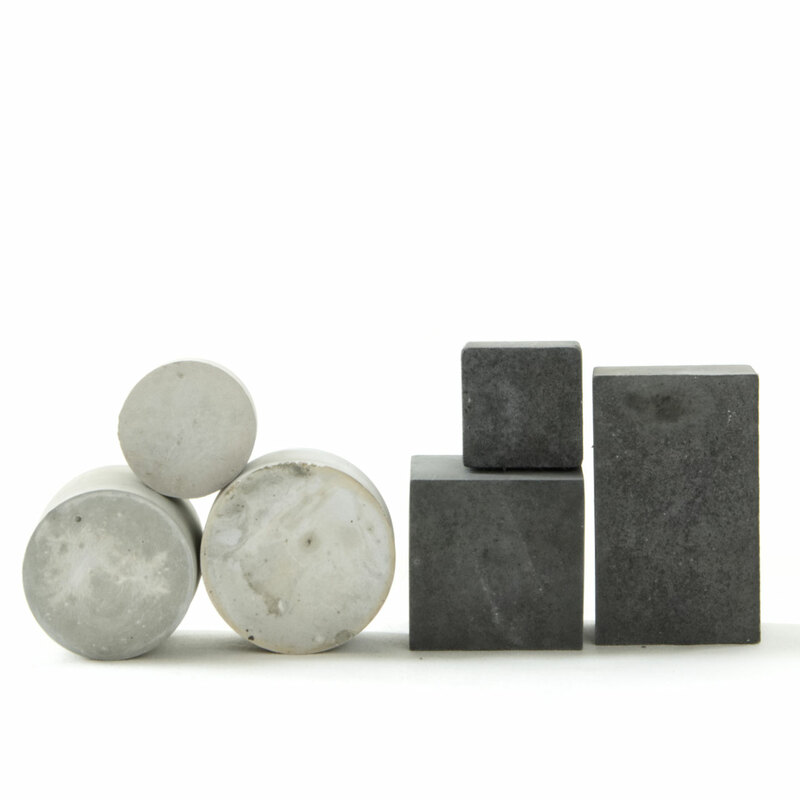 Create a stark or smooth contrast by playfully using the multiple shades of dark to pale grey concrete and combinations this set has to offer. 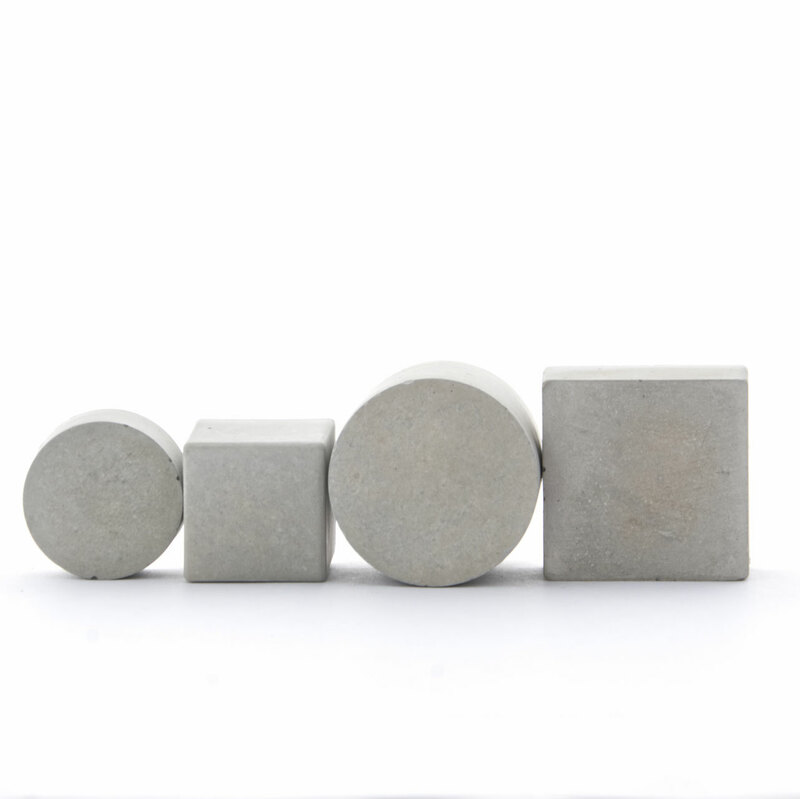 The sculpture solids of cubes, rectangular prisms and various cylinders are stackable in different ways or can simply be aligned. This set could create a modern backdrop at shows, exhibitions or window displays but could also be the prop for editorial photoshoots. 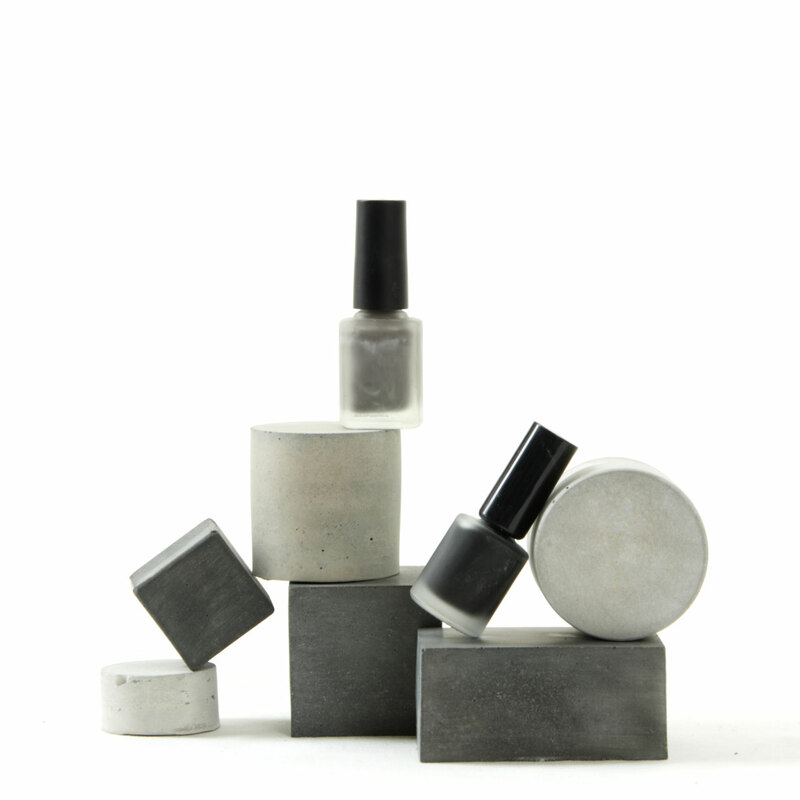 The raw material generates a unique finish every time and this set is no exception with each solid featuring unique imperfections and each prism featuring stunning shades of grey concrete. 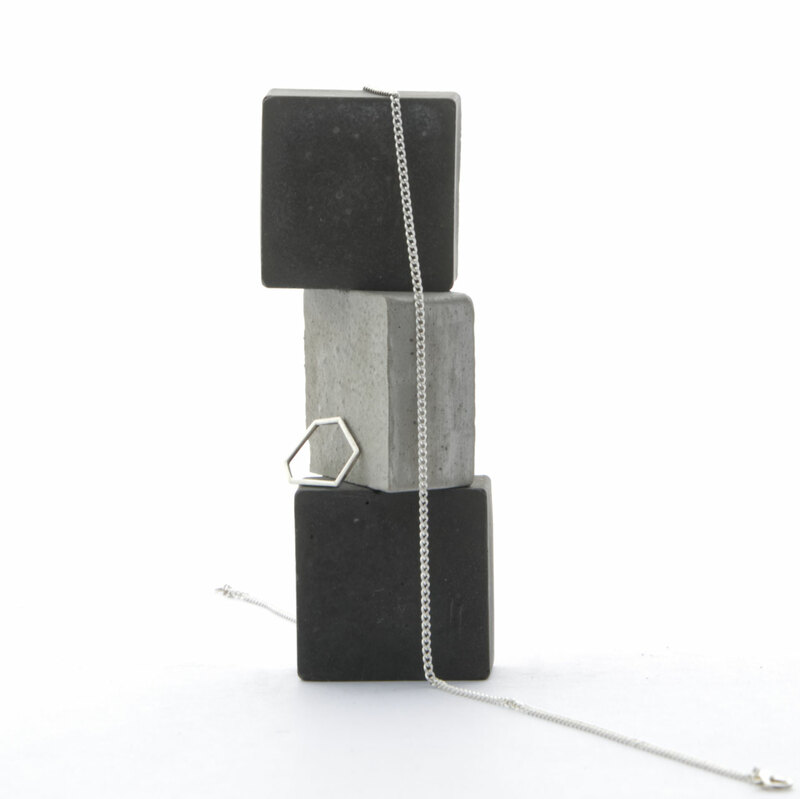 Create unique and minimal sculpture stills or utilise the dark concrete blocks to create unique displays. 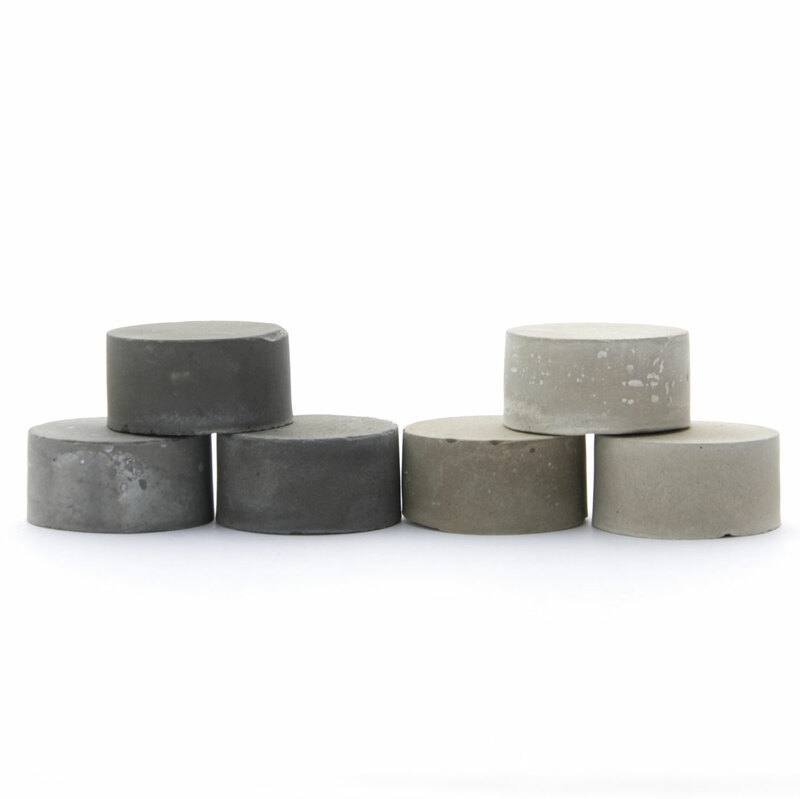 The set of 6 raw concrete sculpture solids is finished in smooth shades of mid to dark grey. The cube, the rectangular prism and the cylinders can be stacked and aligned for editorial photo shoots and exhibition product displays or simply arranged to form the base for your jewellery market stand. 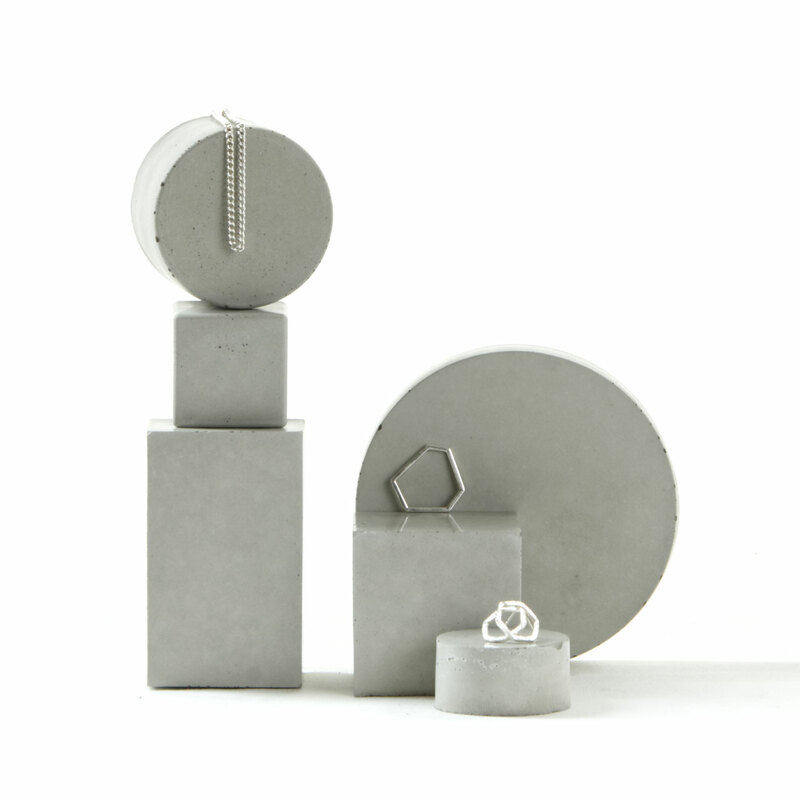 Create contrast to these individually hand crafted concrete volumes with your pins, jewellery or small cosmetic designs. 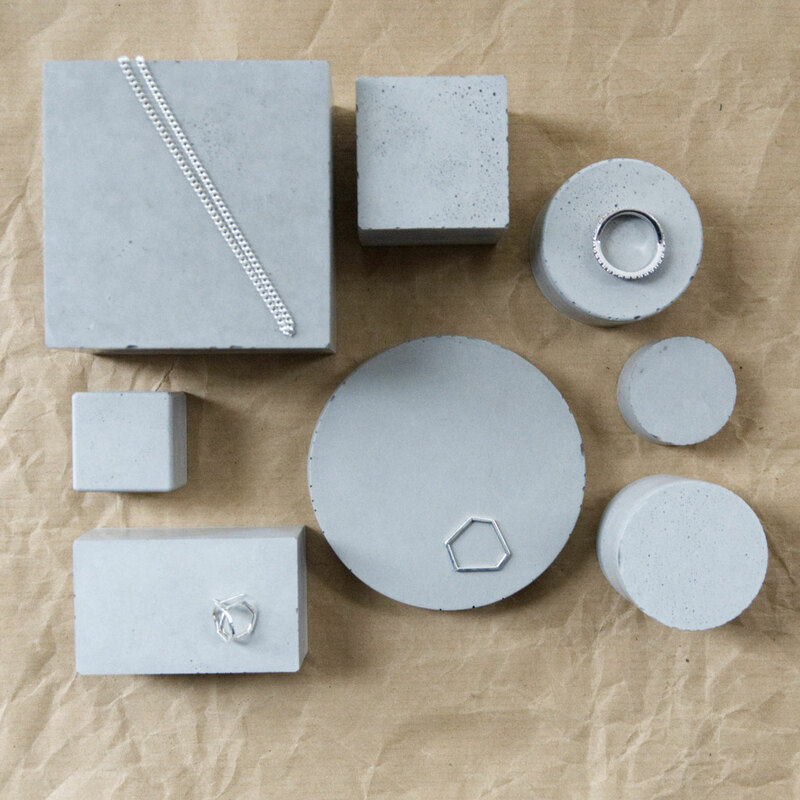 A pale grey concrete geometric delight. 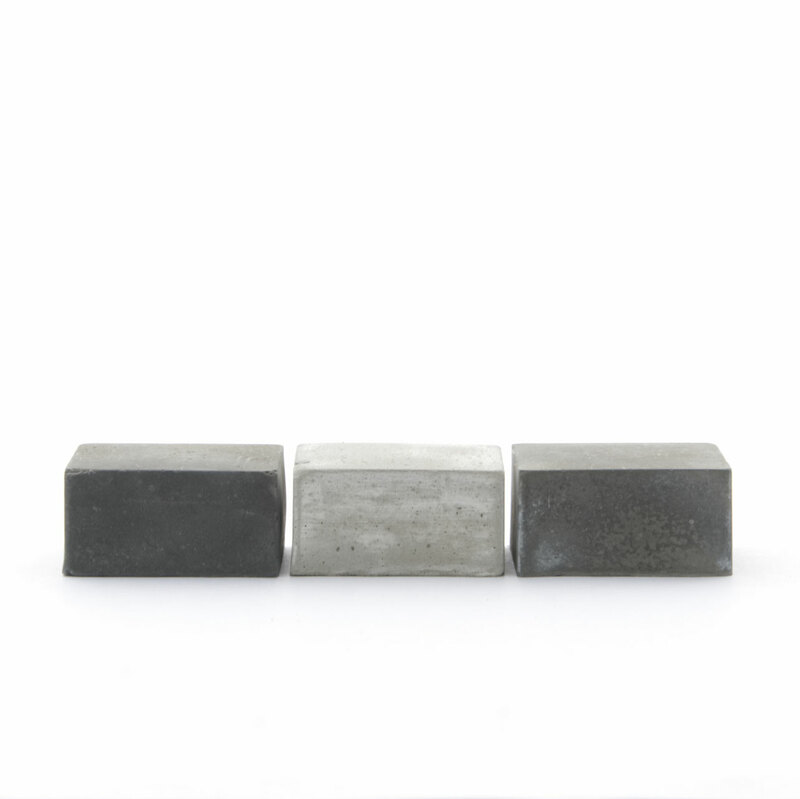 This set of four jewellery props features 4 different sculpture solids with unique textures and imperfections. 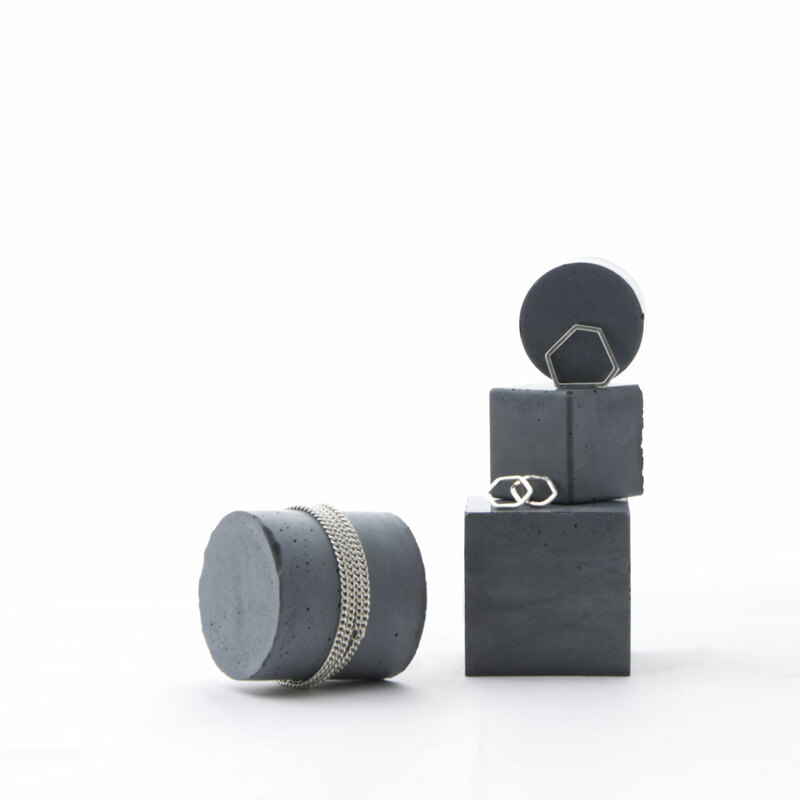 These simple but elegant cubes and cylinders provide the perfect backdrop for the display of anything shiny – like jewellery or pins. They are finished smooth and are very tactile. 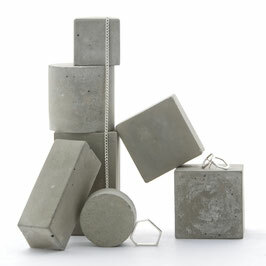 Have a play and display your objects in various modern ways by stacking or aligning the concrete prisms. 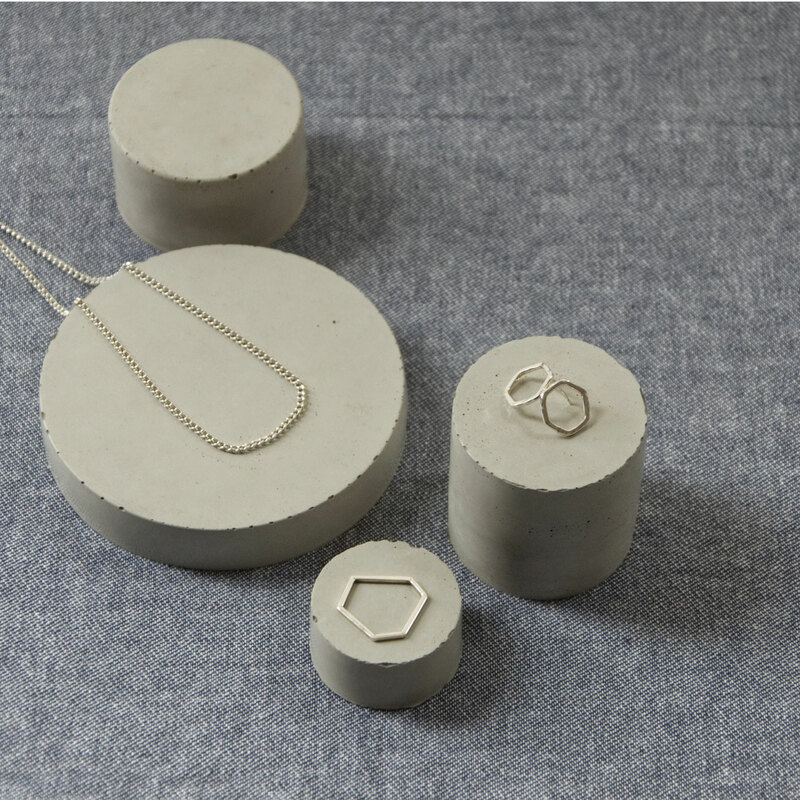 A wonderful pale grey combination of eight geometric concrete shapes to display jewellery and other small designs for photoshoots, exhibitions or window displays. The cylinders, cubes and rectangle prisms of various sizes provide endless stacking and display opportunities which will let your products shine. 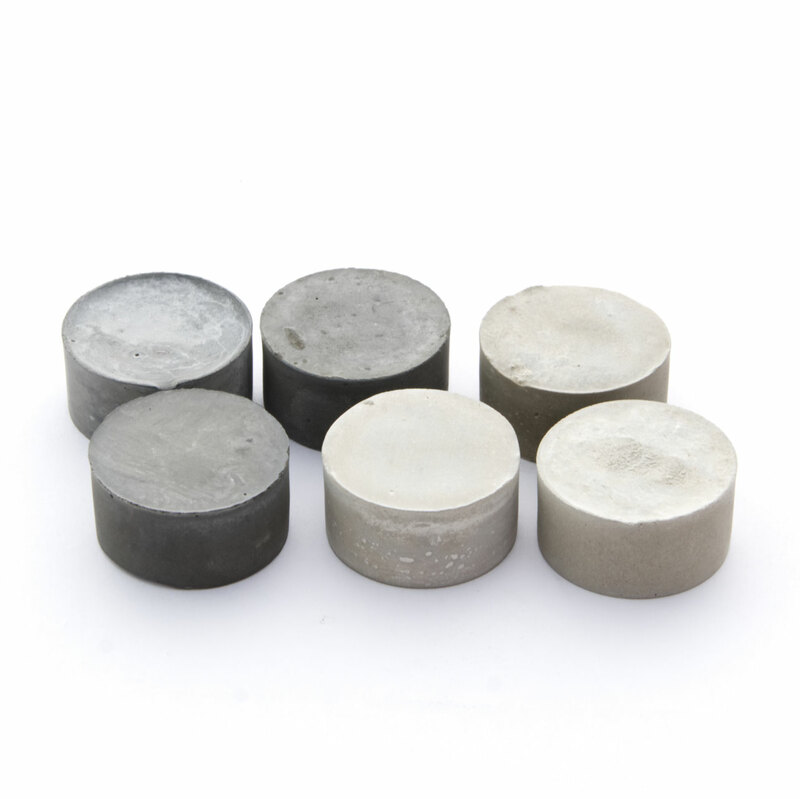 The raw material generates a unique finish every time and this set is no exception, it is finished very smooth to a almost gloss finish and is very tactile – each prism features stunning shades of pale grey concreted unique imperfections. A set of four stackable grey concrete cylinders to create various stunning displays for your jewellery, pins or cosmetic products. 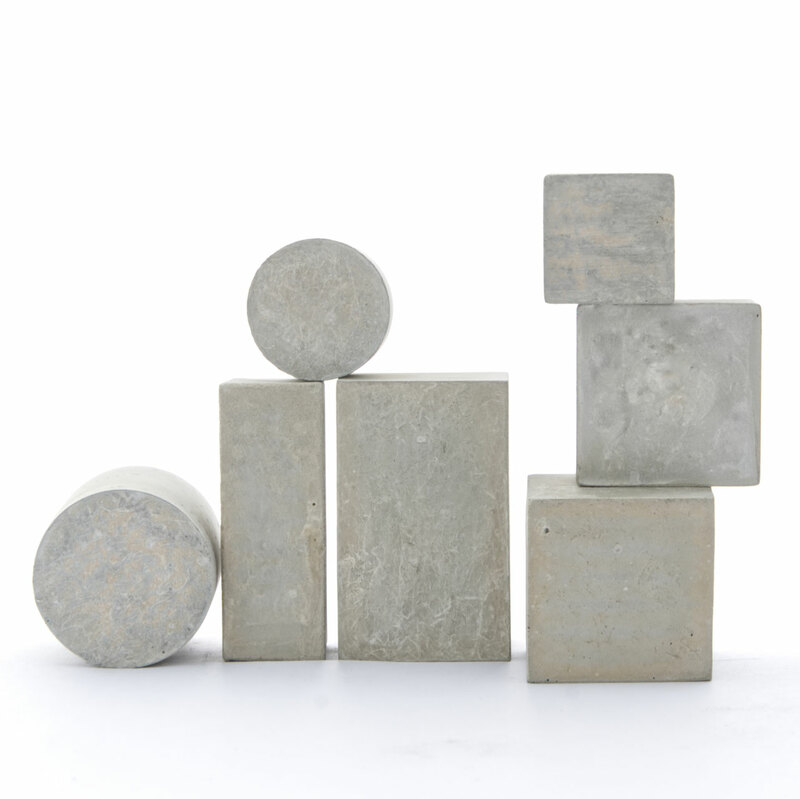 The raw geometric concrete comes in different shades of pale grey which is finished almost glossy and is very tactile. This set provides a wonderfully soft contrast to pale objects and allows to create strong contrast to darker items you might intend to display. 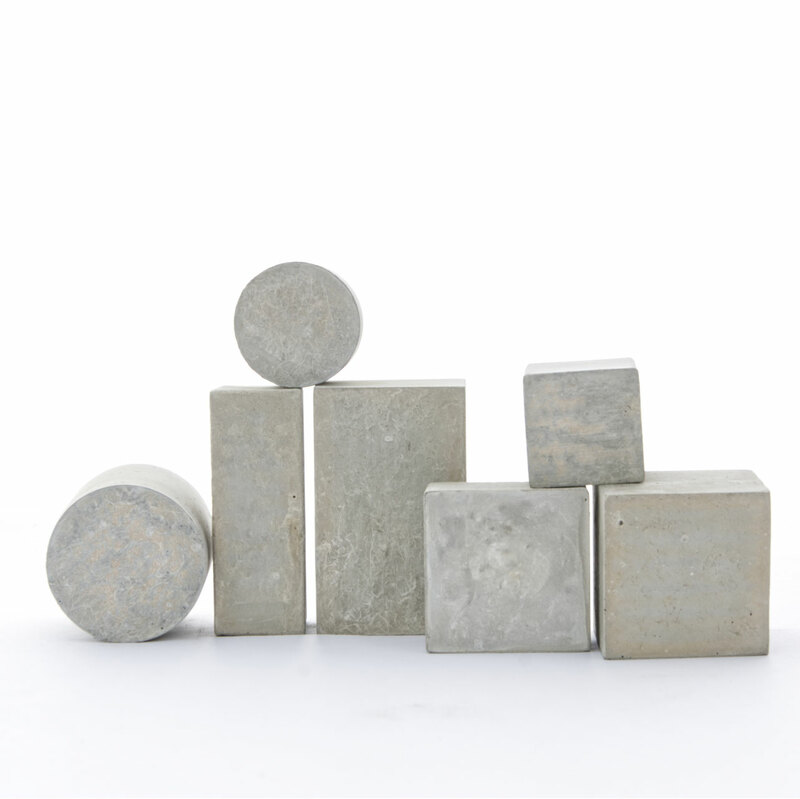 The smooth finish of the raw concrete is unique allowing you to create a beautifully trendy backdrop for window or retail displays, at exhibitions or trade fairs, market stands or for photoshoots. 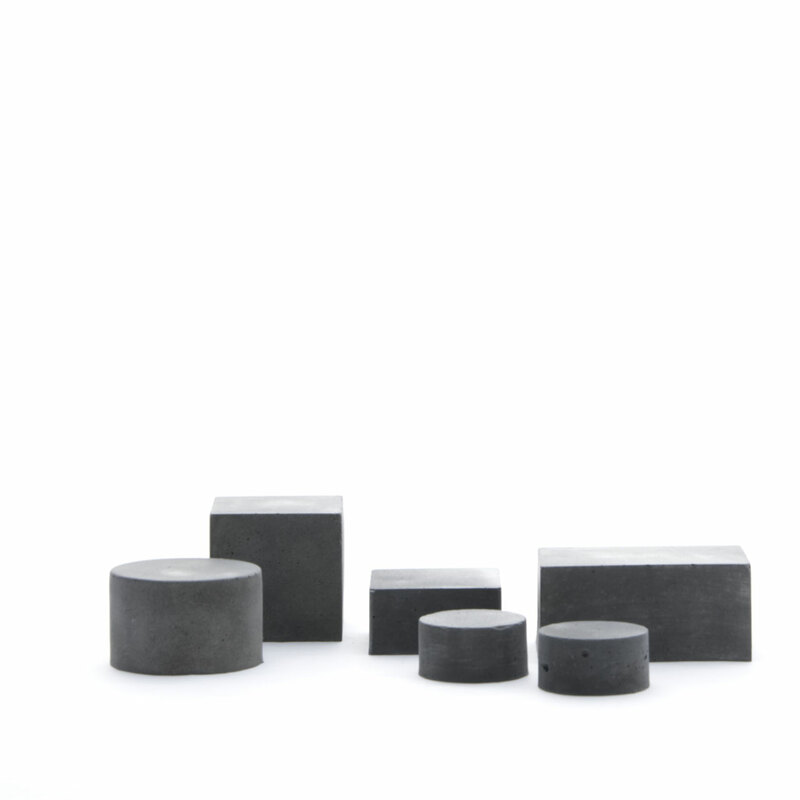 A contemporary large geometric concrete prism set of 8 sculpture solids. This pale grey concrete set features cubes, rectangular prisms and various cylinders which are beautifully stackable in different ways or can simply be aligned to display jewellery or pins and other items. 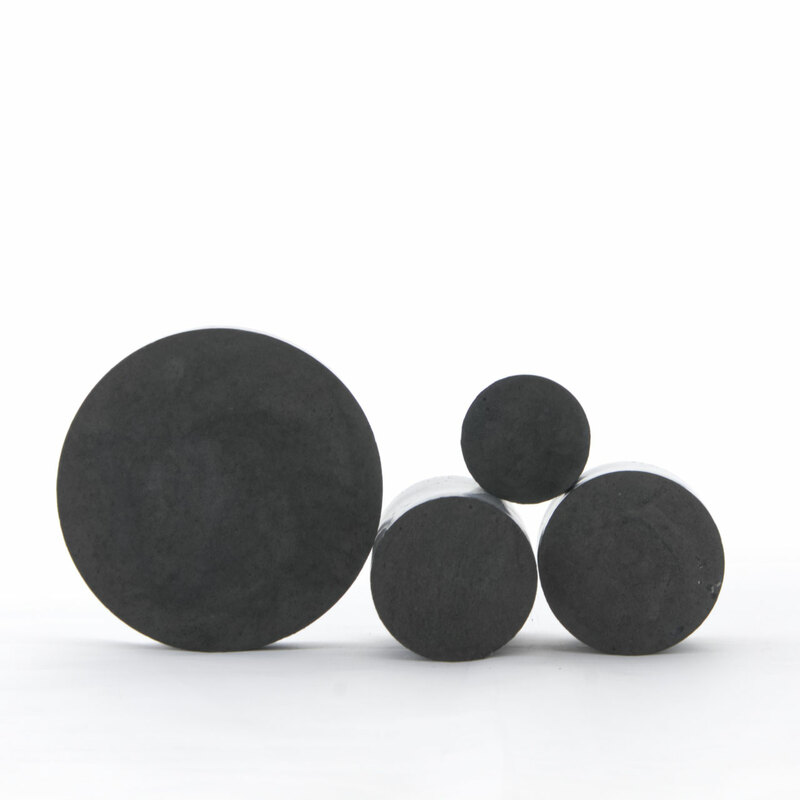 This set could create a modern backdrop at shows, exhibitions or window displays. 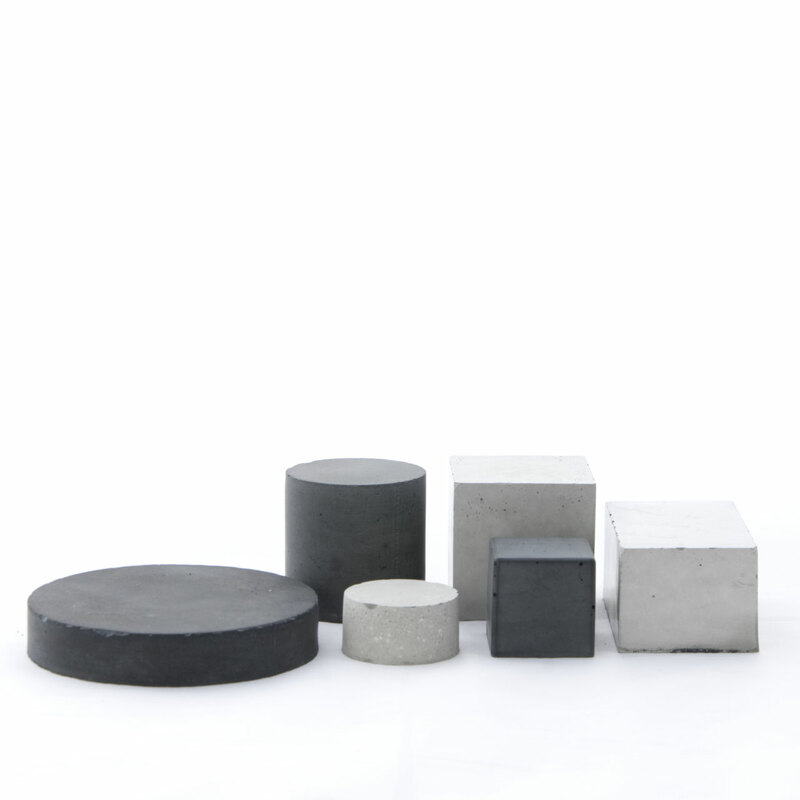 The raw material generates a unique finish every time and this set is finished particularly smooth with an almost glossy finish to many sides of the solids – each prism features stunning imperfections while being smooth and tactile. 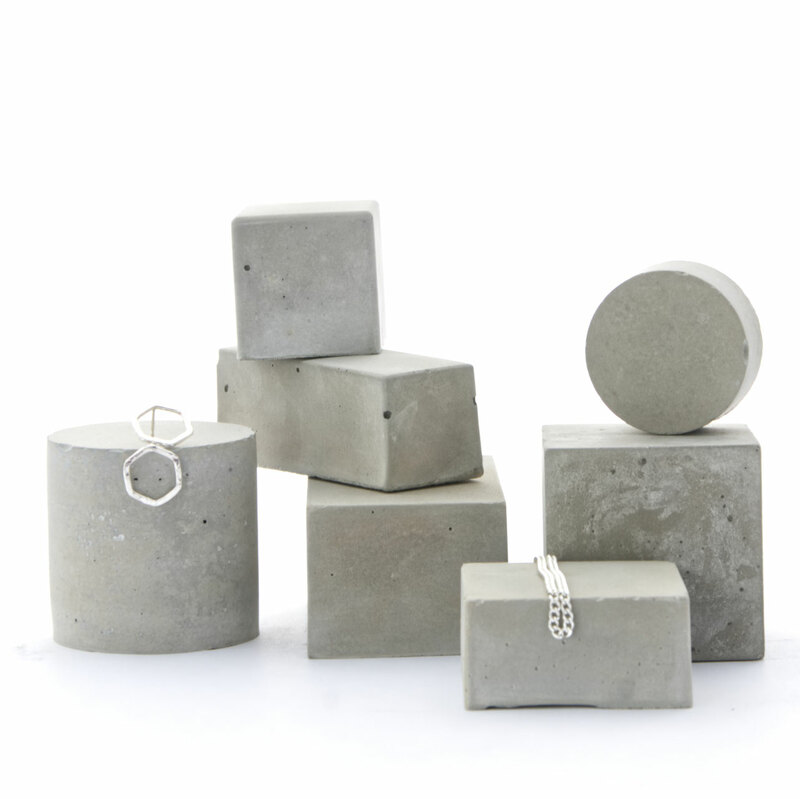 The shades of pale grey concrete are a wonderful contrast for editorial photo shoots, may the first pictures be an inspiration. 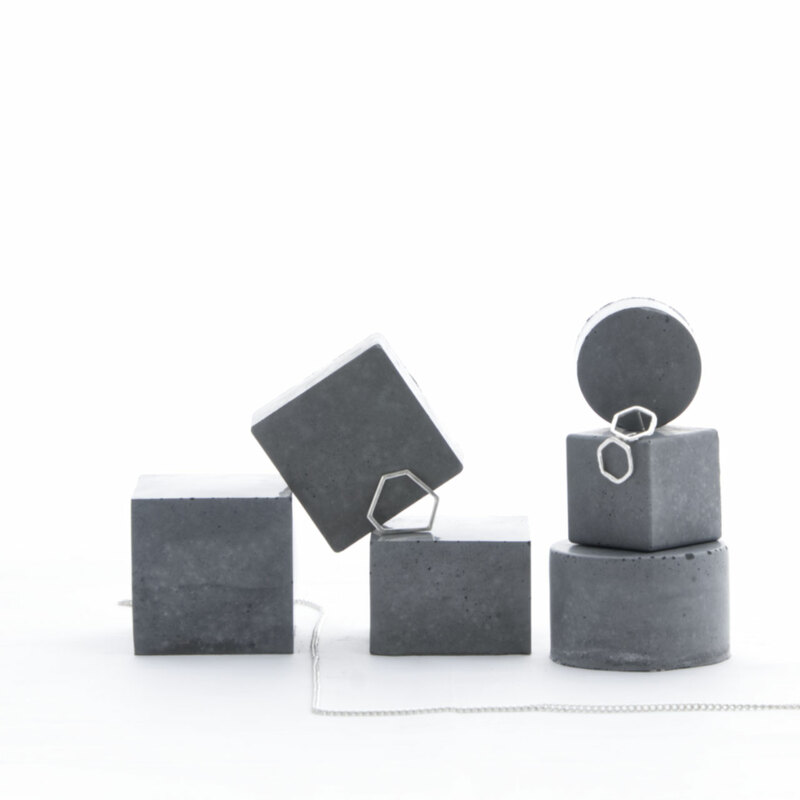 Create unique and minimal sculpture stills or utilise the grey geometric concrete blocks to create unique displays for jewellery or other small items like cosmetics for photoshoots, market fair or exhibitions. 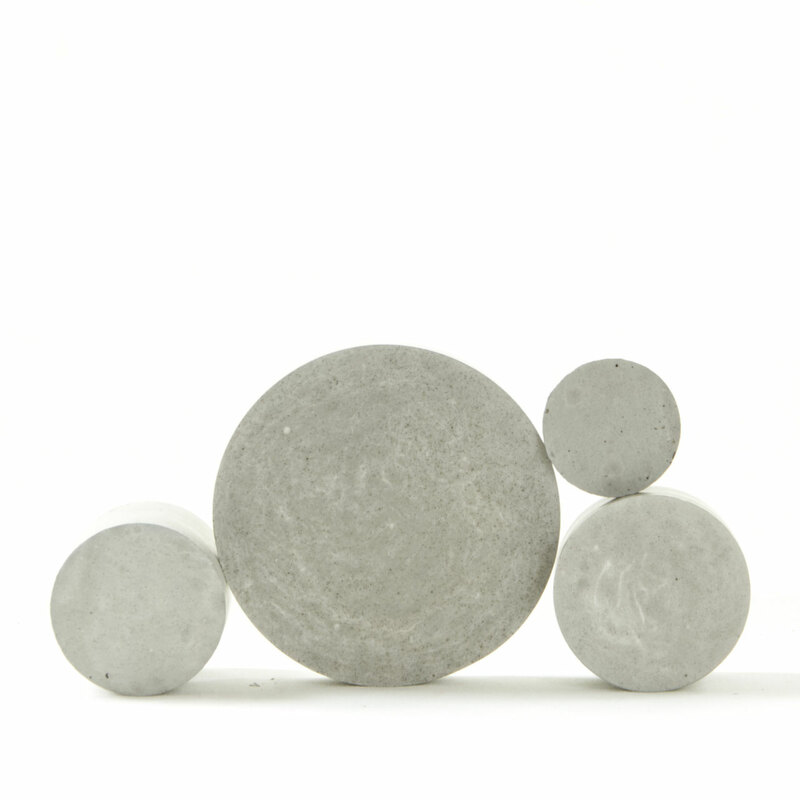 The set of 6 raw concrete sculpture solids is finished in smooth shades of pale grey. 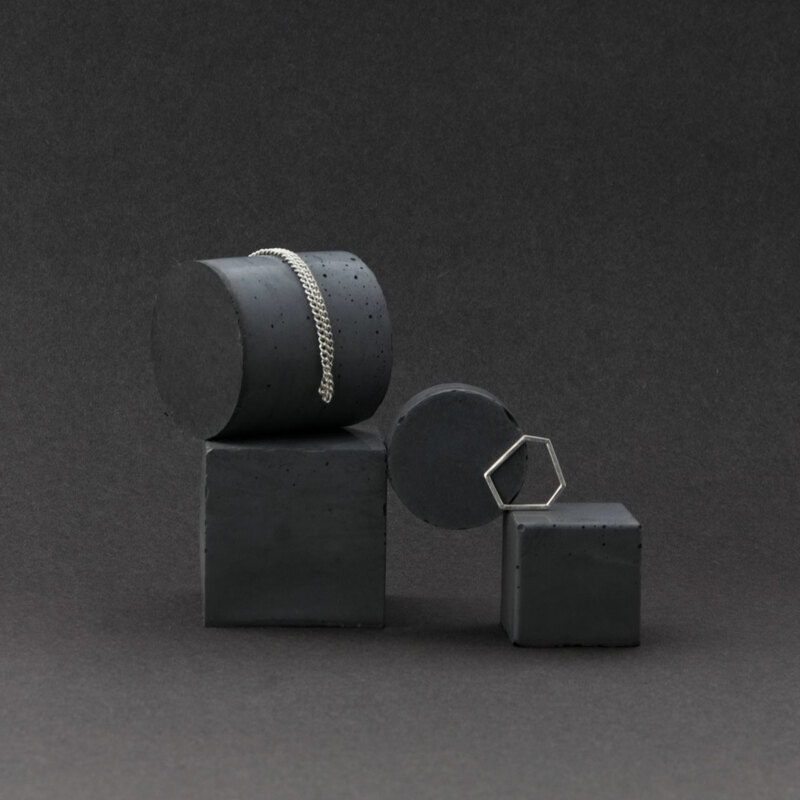 These cubes, rectangular prisms and cylinders can be stacked and aligned for editorial photography and retail product displays or simply arranged to form the base for your jewellery market stand. 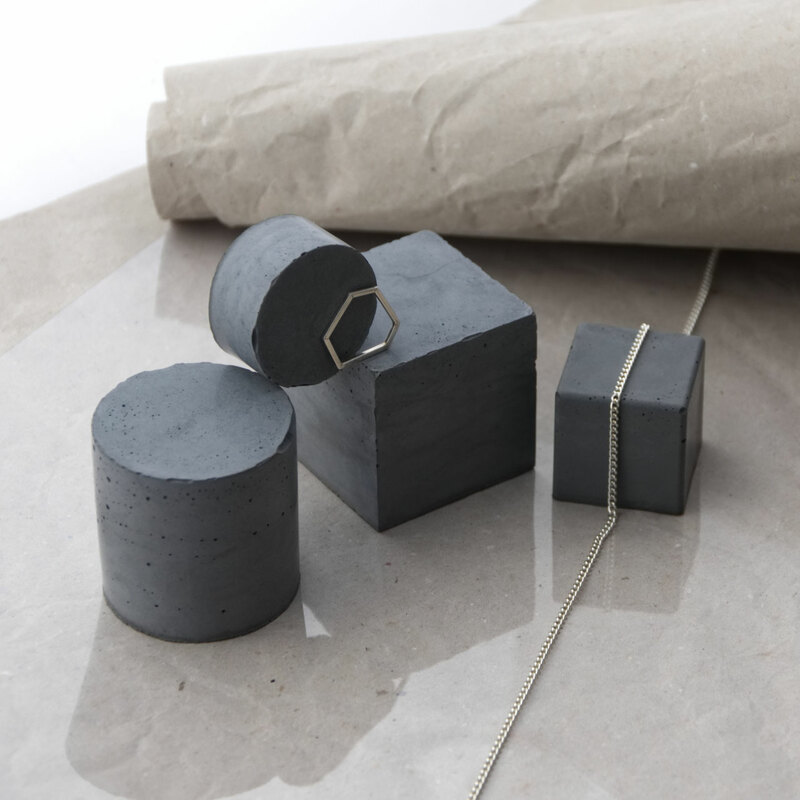 A set of eight geometric sculpture solids made of dark grey and pale grey concrete. 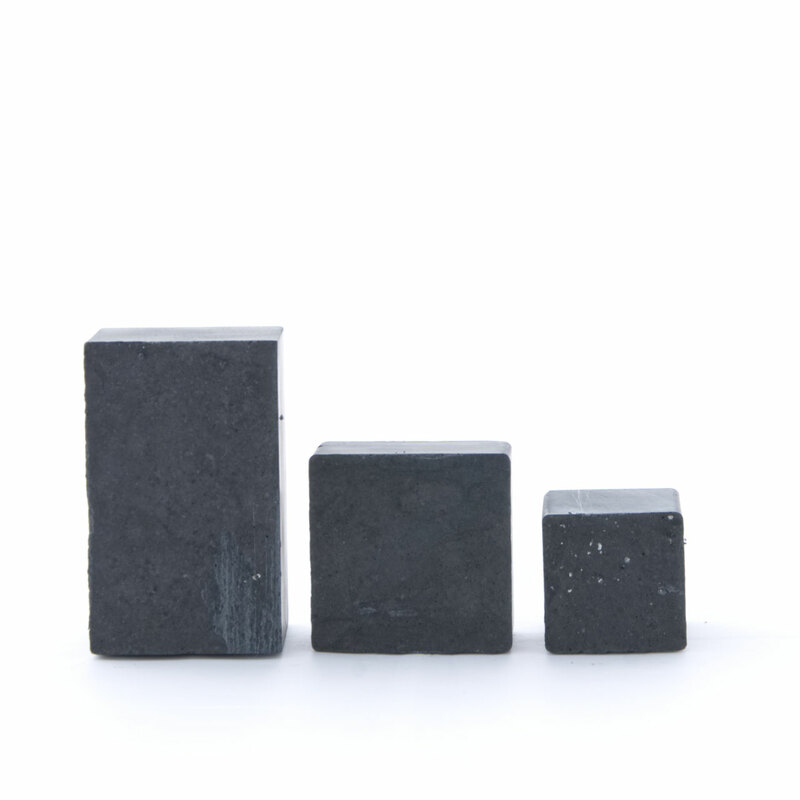 Each prism features unique textures and imperfections and allows a stacking in various ways. 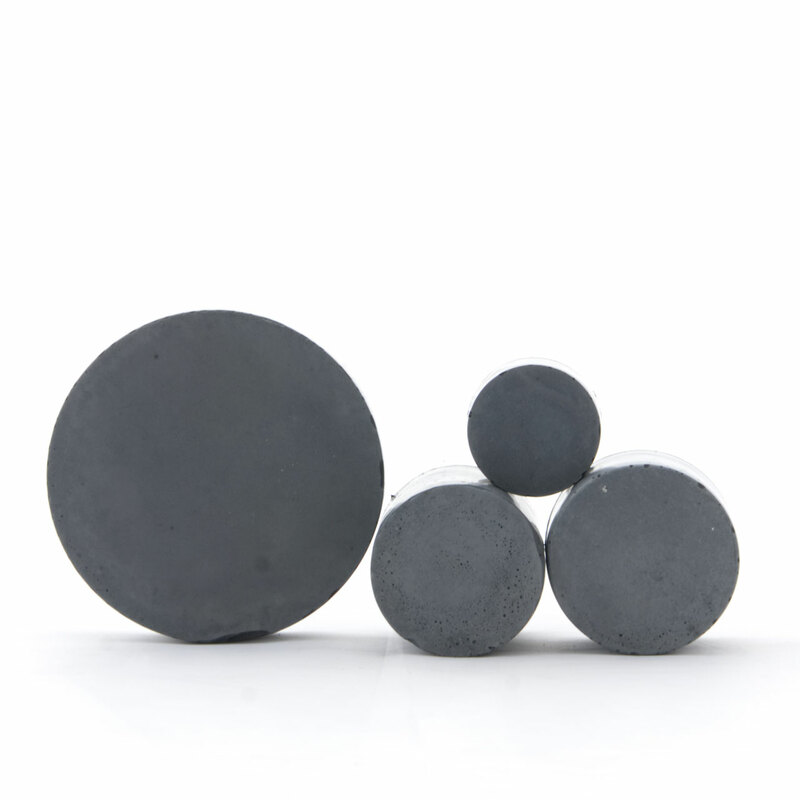 These simple but elegant forms can provide a beautiful and ever changing backdrop to display jewellery, pins or small cosmetic items. They are finished fairly smooth and are very tactile. 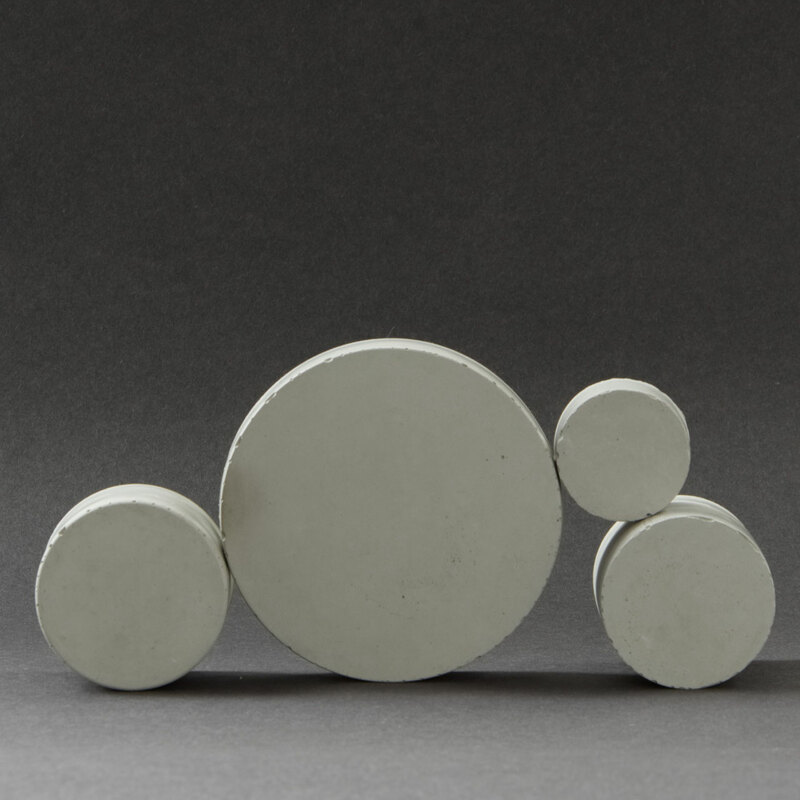 Have a play and display your objects in various modern still-lives by stacking or aligning these minimalistic forms. 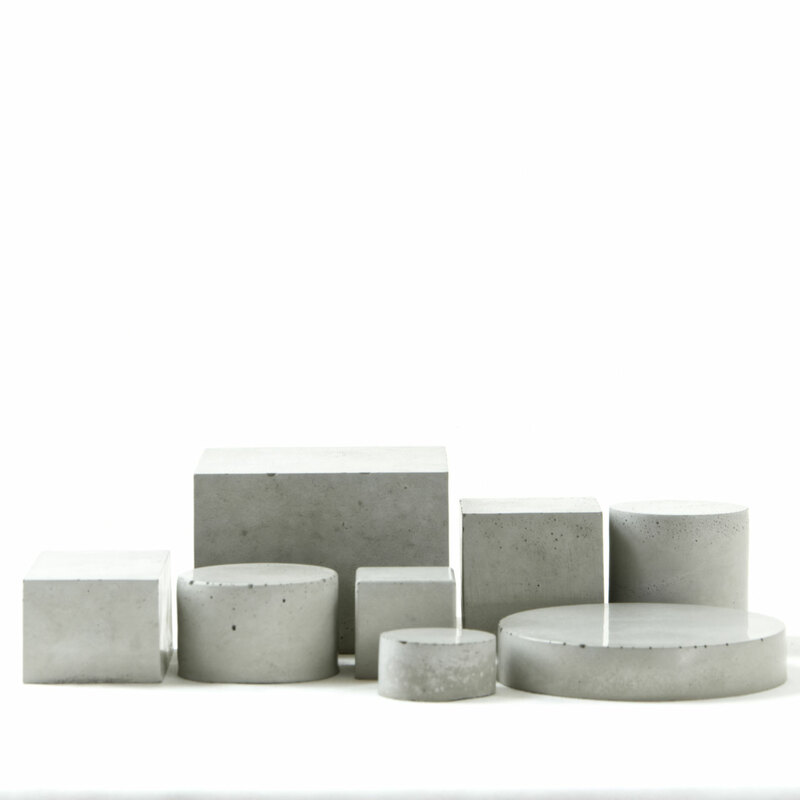 A pure set of 4 geometric concrete sculpture solids featuring unique textures, voids and cracks. 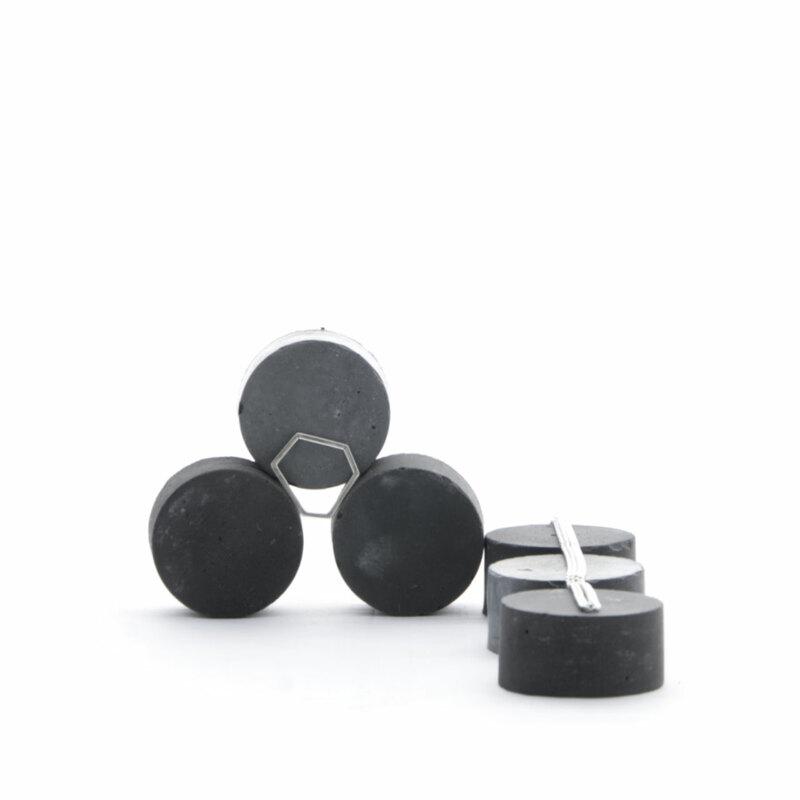 These simple but elegant prisms provide the perfect backdrop for the display of anything shiny – like jewellery, small cosmetics or pins - during exhibitions, photoshoots or for your retail display. 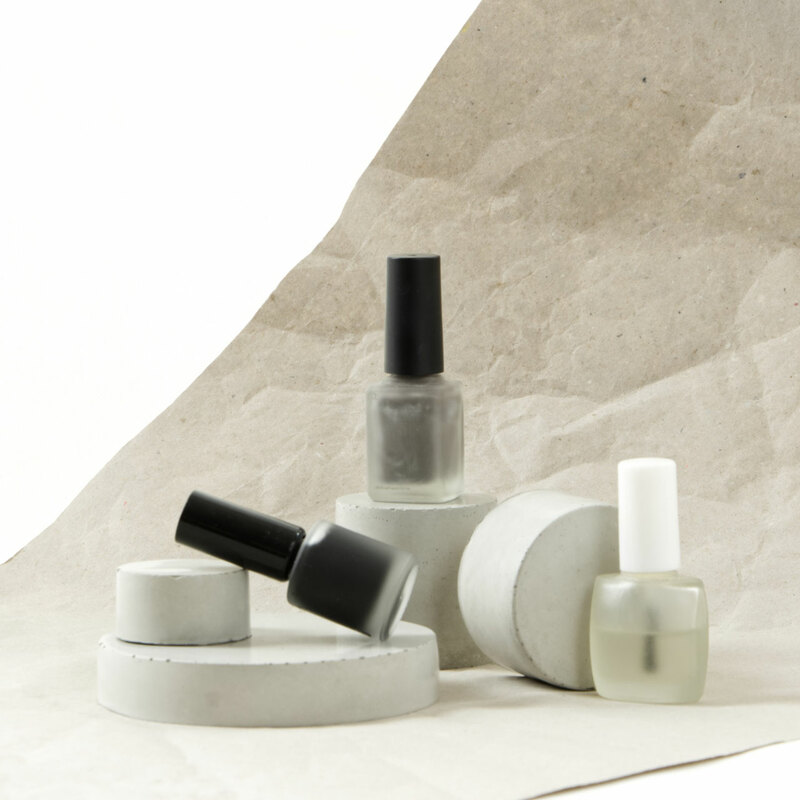 They are finished smooth and are very tactile and feature different shades of pale grey. This large monochrome geometric concrete sculpture solid set of 6 offers various and stunning ways to display jewellery, pins and other small items like cosmetics. 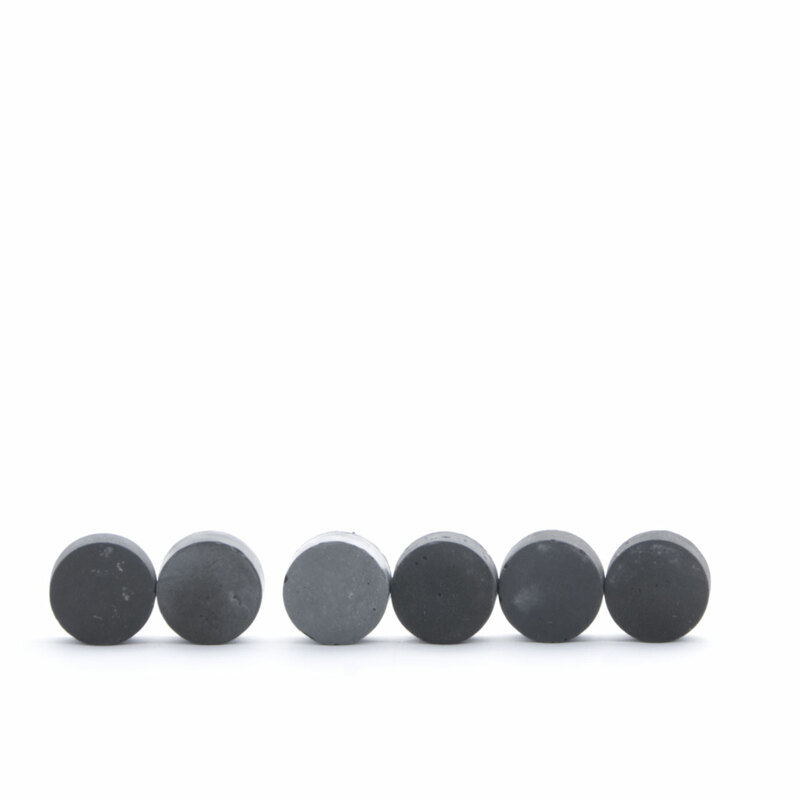 Create a stark or smooth contrast by playfully using the multiple shapes as well as pale grey shades of concrete and combinations this set has to offer. 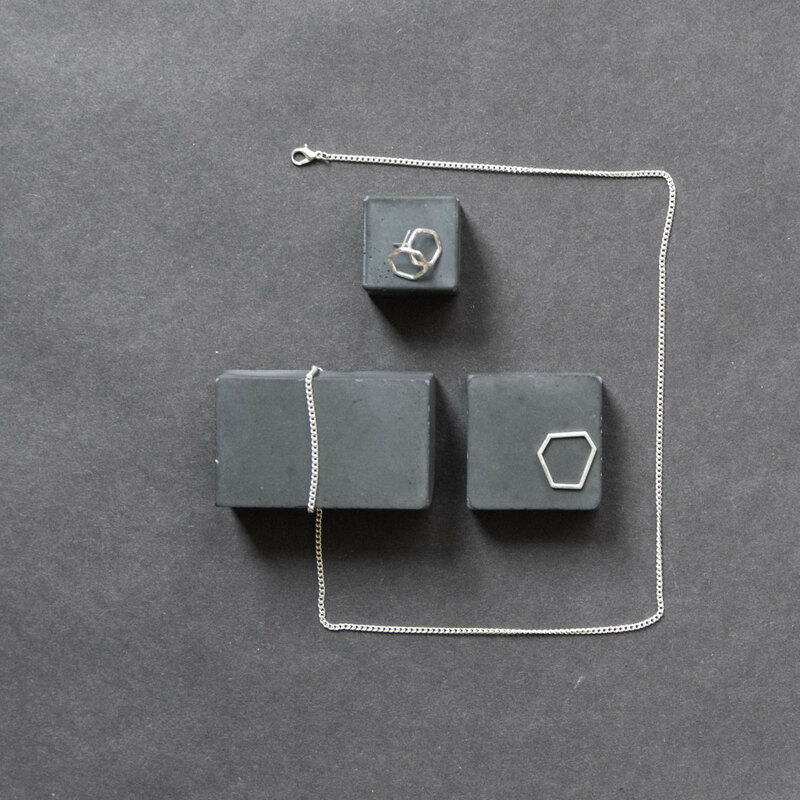 The raw rectangular prism, cubes and cylinders are stackable in many ways or can simply be aligned to create wonderful flat-lays. This set could create a modern backdrop at shows, exhibitions or window displays but could also be the prop for editorial photo shoots. 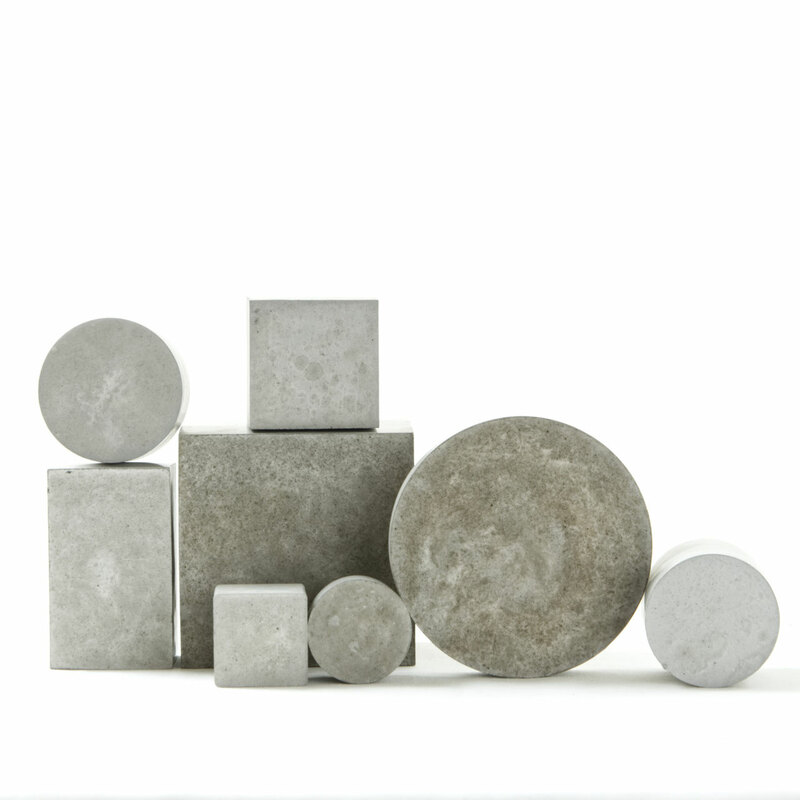 The raw material generates a unique finish every time and each solid features unique imperfections and shades of pale grey concrete. 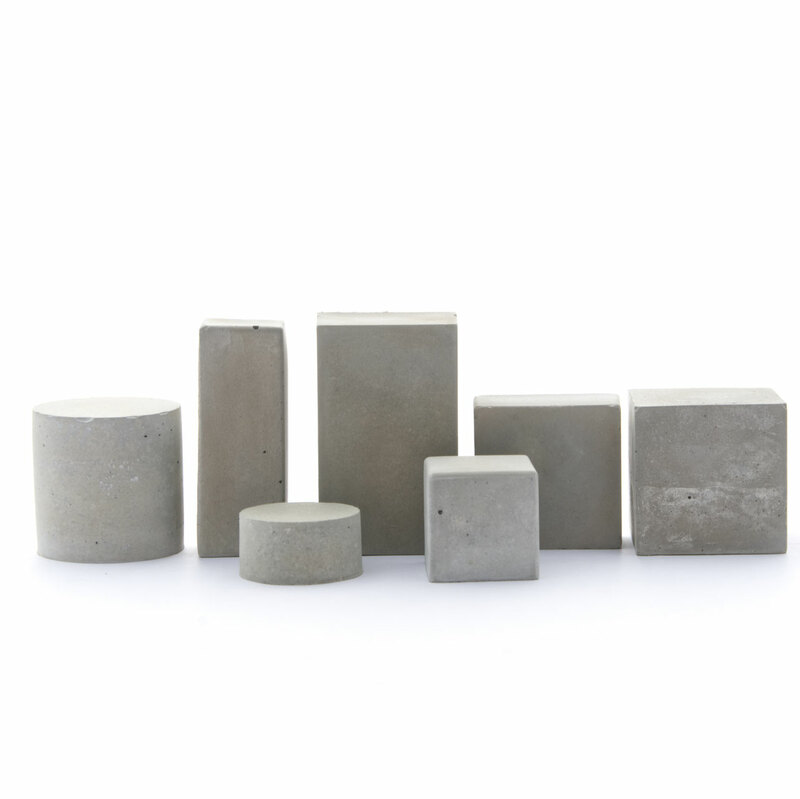 This selection of 2 concrete cubes and 2 cylinder blocks is just perfect to display jewellery for markets or photoshoots. 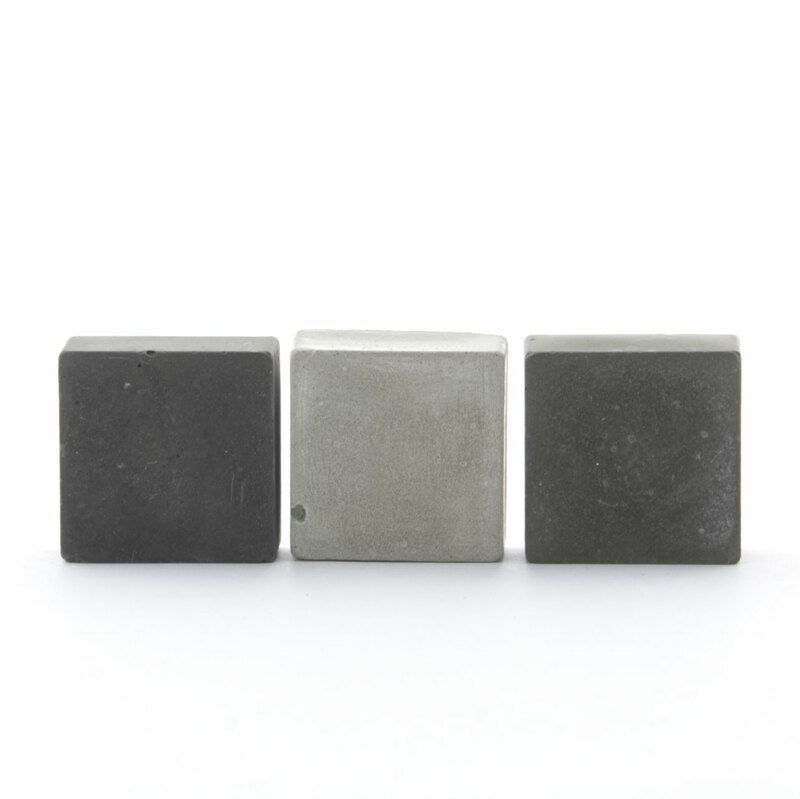 Create stunning retail displays by stacking or aligning these prisms and cubes in shades of charcoal to dark grey concrete to your liking. 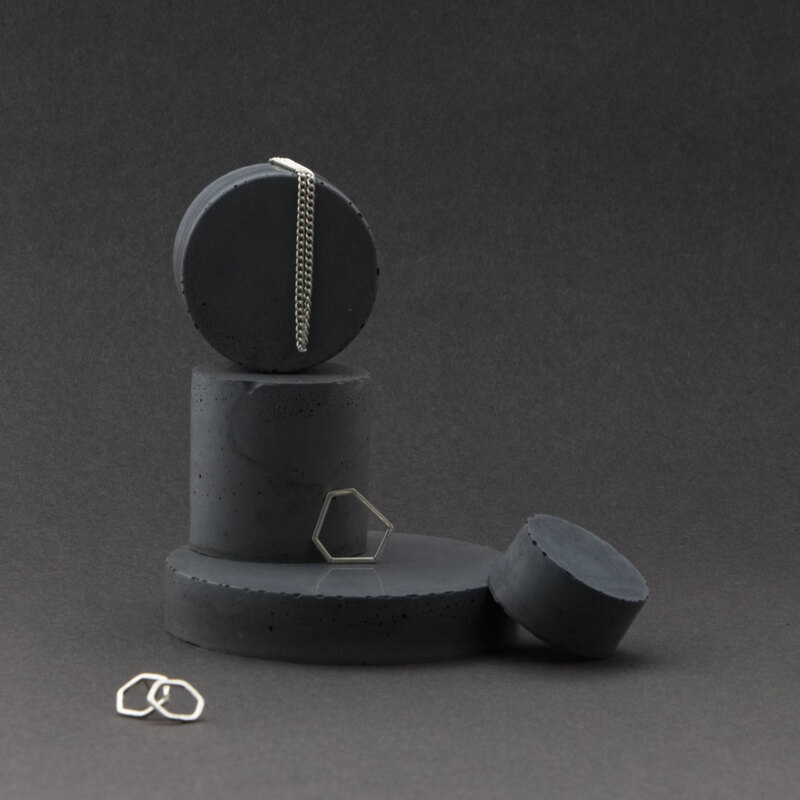 They are finished fairly smooth, many sides have a decent shine to them and allow you to create your very own unique modular sculpture before adding your jewellery design, pins or other small items. 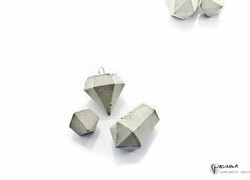 Let your products shine in-between these beautifully unique concrete finishes and create a trendy backdrop using these cool simple tactile geometric concrete shapes. 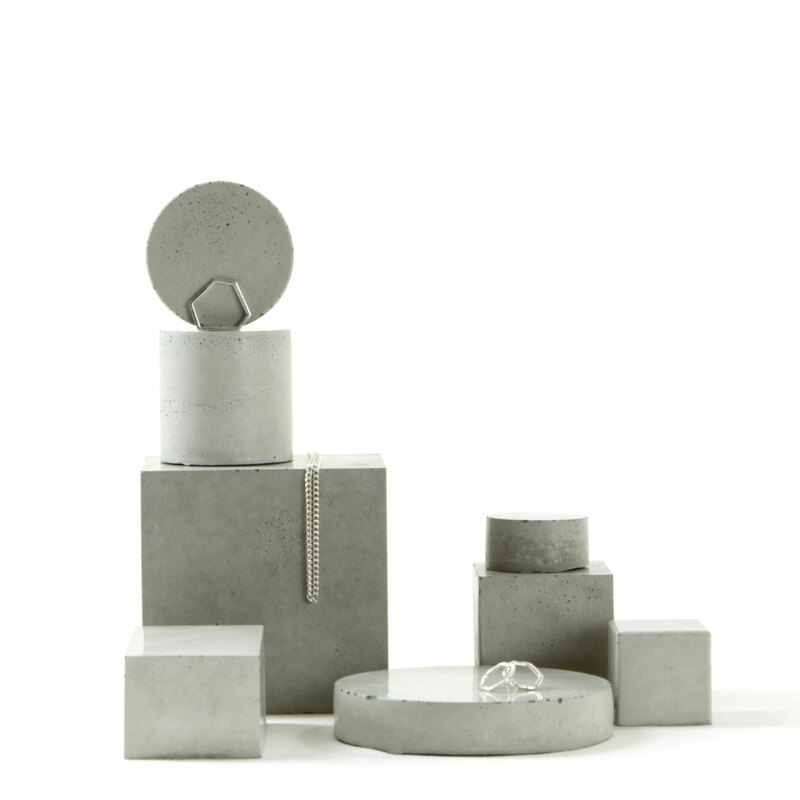 A minimal concrete block set based on the humble cube. The rectangular prism shapes feature a textured as well as very smooth sides to display jewellery and other small works. 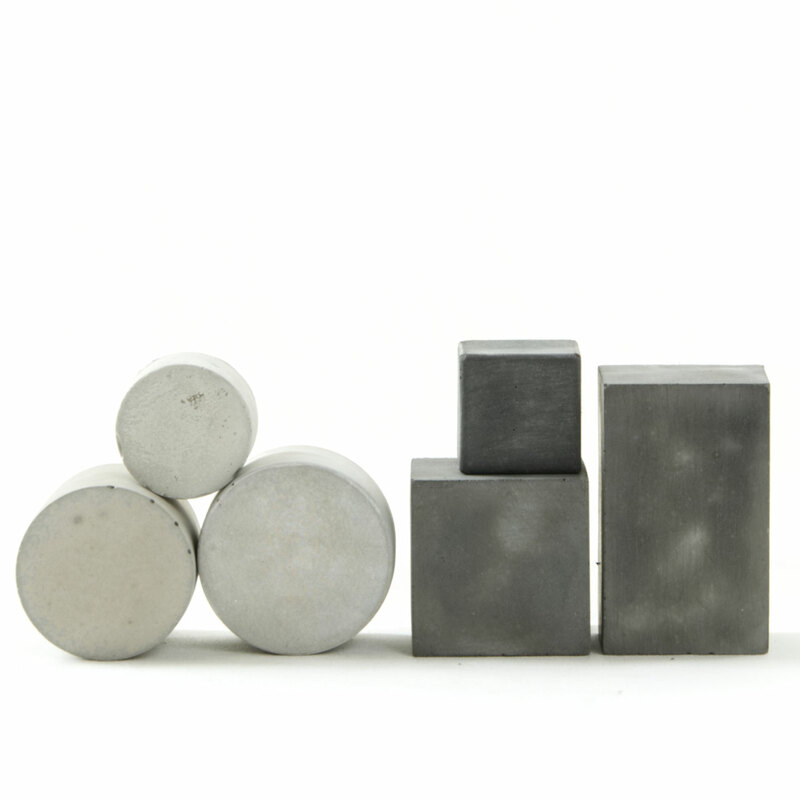 These solids are easily stacked or aligned and display in wonderful contrast to shiny objects. A still of those blocks can be a wonderful backdrop, sculpture still or photo prop. 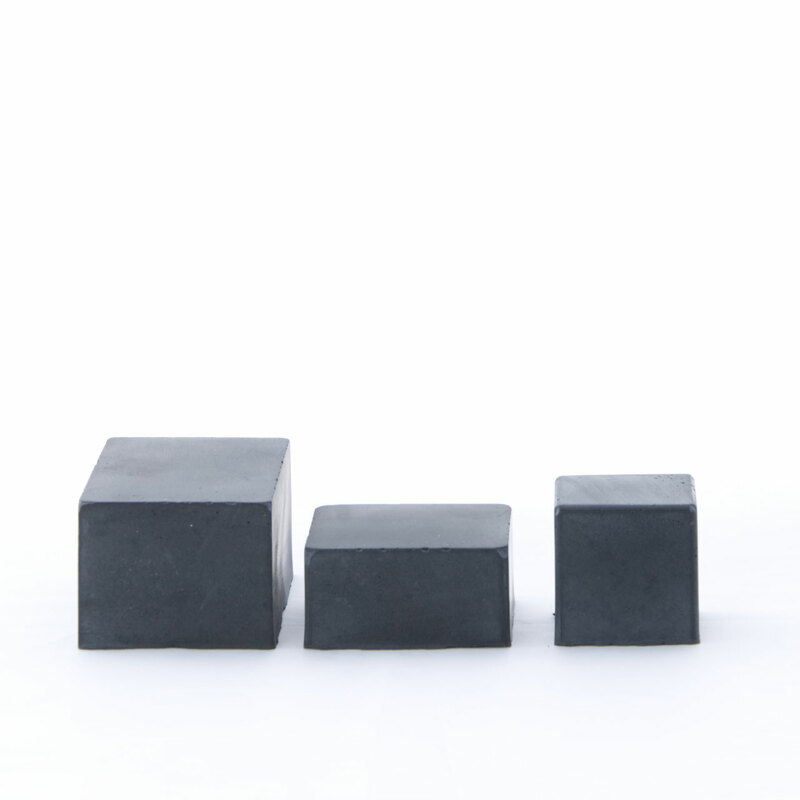 The prisms help to elevate small items or designs of your choosing. 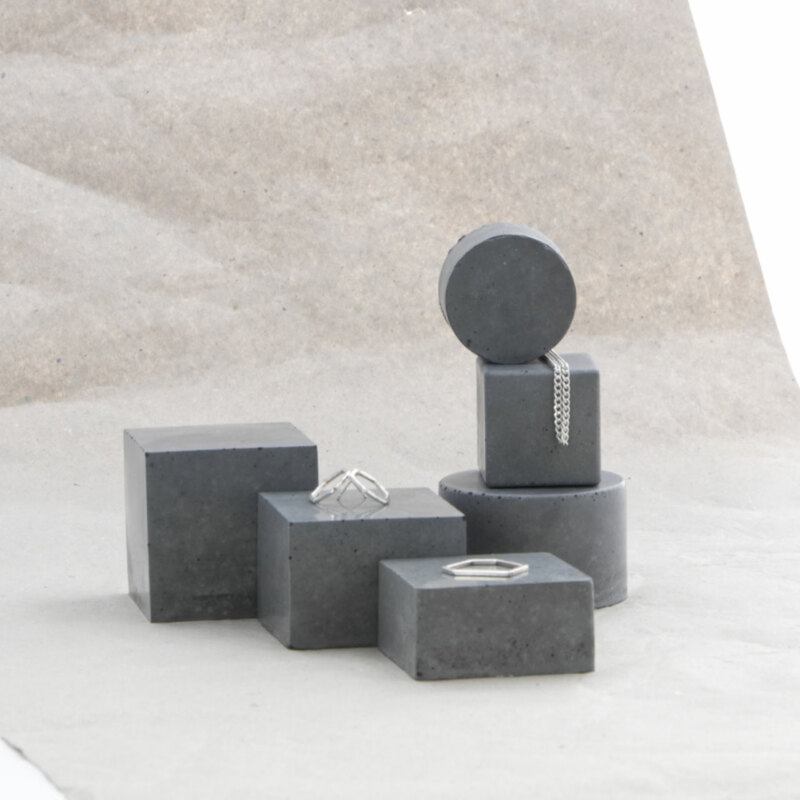 Have a play every time you arrange them to form the base for your jewellery photo shoot, exhibition or retail display, market stand as well as window display. each features different shades and textures in itself - please choose below, thank you! 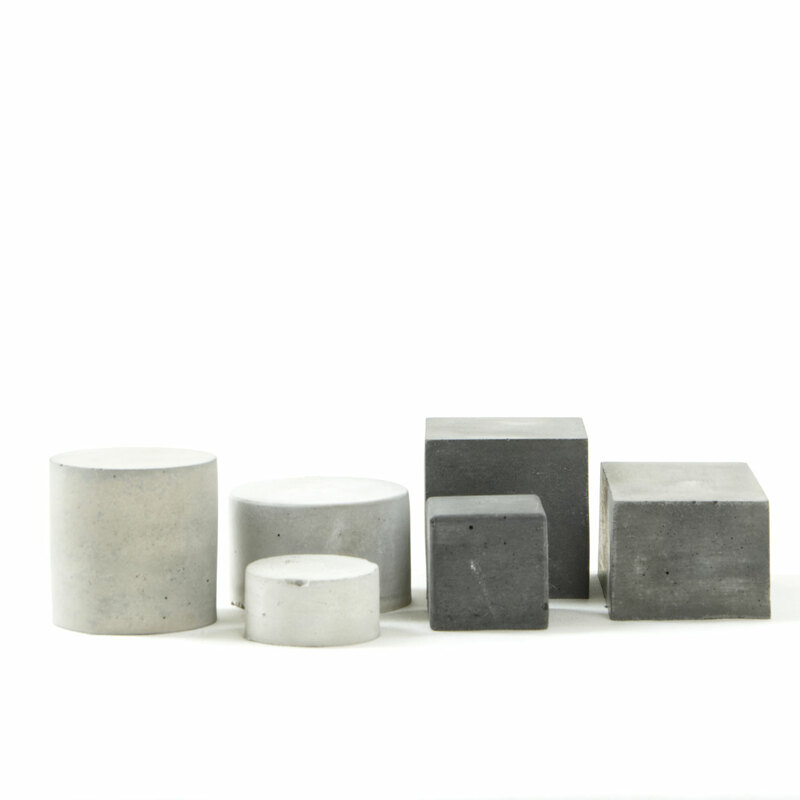 A set of 6 different geometric concrete shapes featuring a rectangular prism, two cube and three different cylinders. 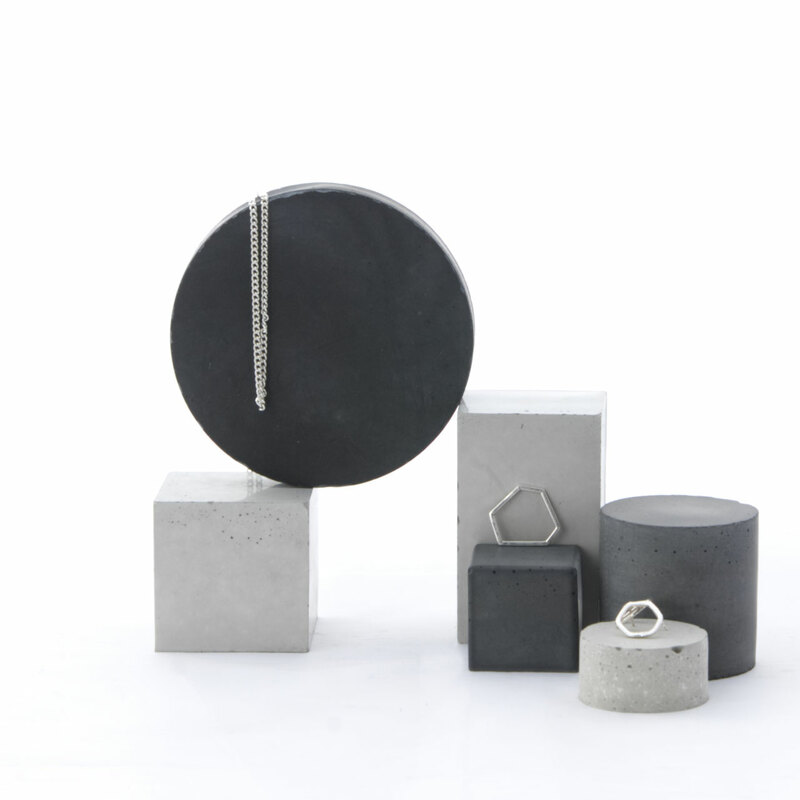 The overall monochrome look consists of pale and dark grey concrete which is finished very smooth with each solid featuring one textured side. Set them up in playful ways, display with them at market fairs, window displays, exhibitions or make contemporary simplicity the perfect backdrop for your next photoshoot. 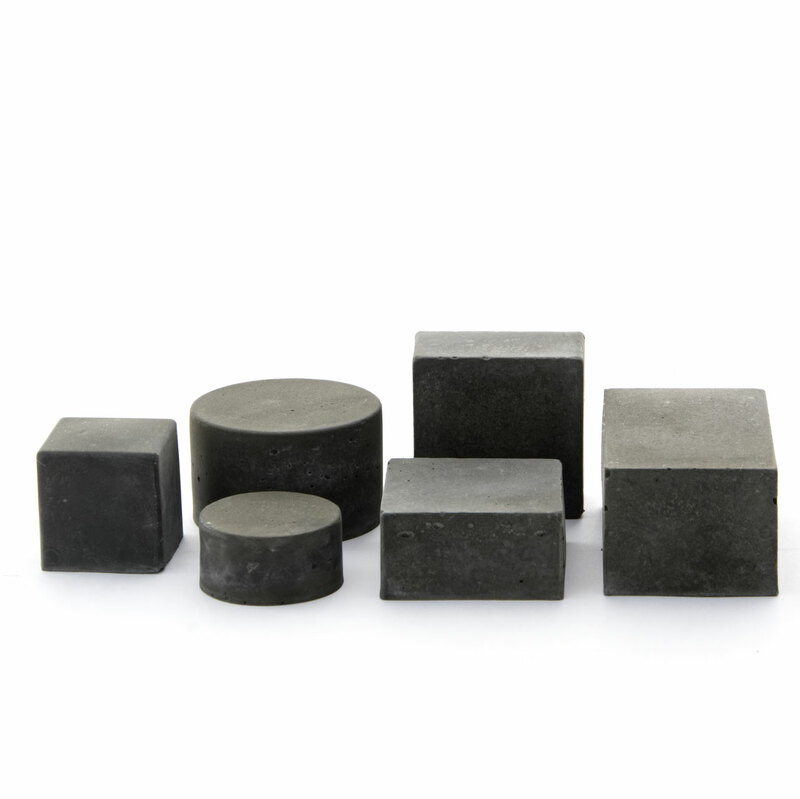 The surface of this raw material is always a winner and provides great contrast to leather or metal jewellery, cosmetic or pins. 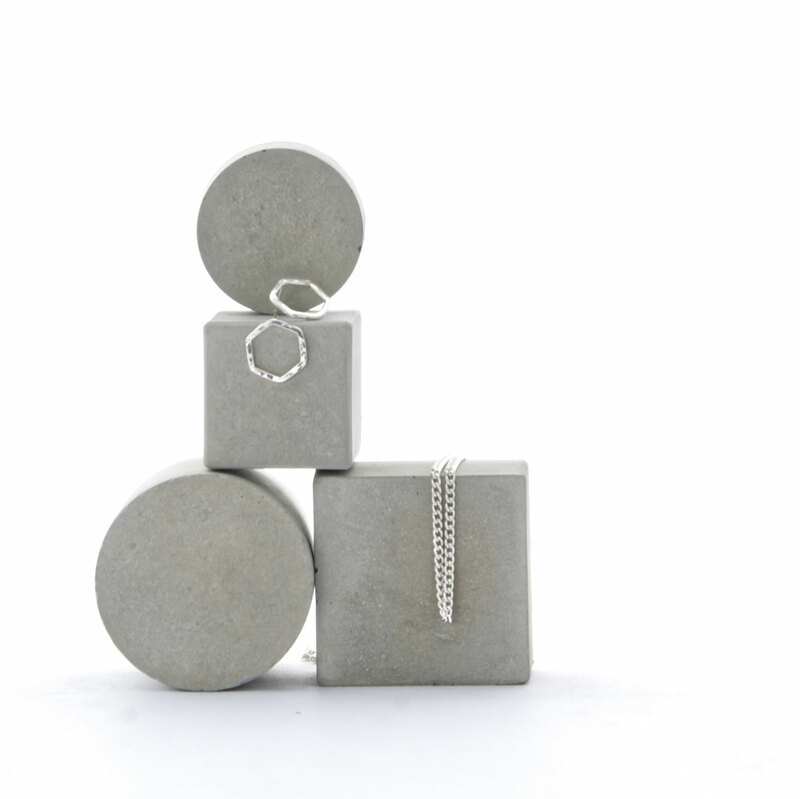 This concrete cube set of 3 has the most simplistic and elegant look. It offers in its simplicity wonderful stacking and displaying options as well as contrast to products and / or background options. 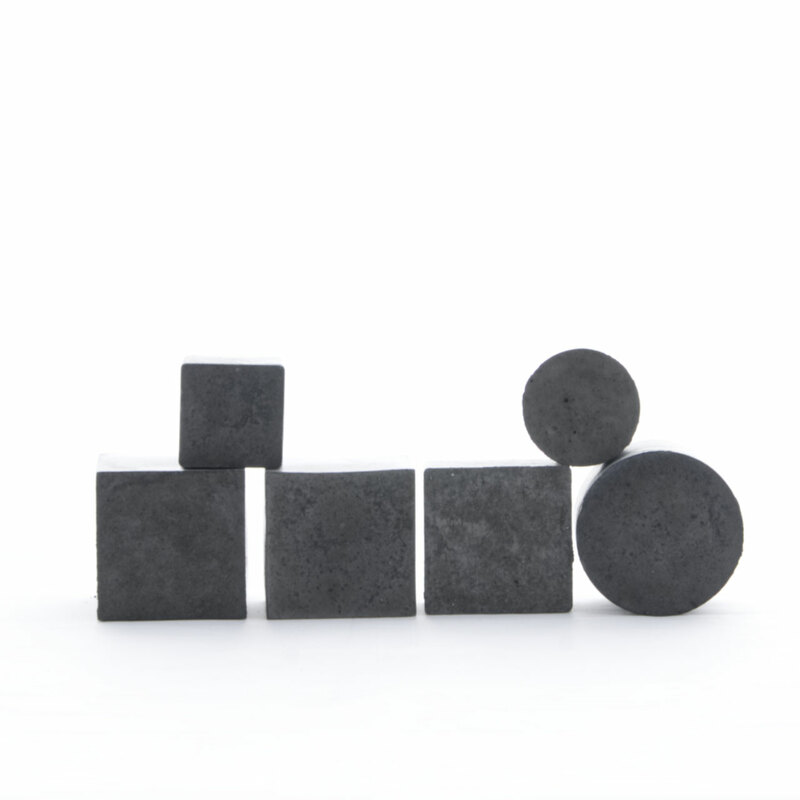 A still of those blocks can be a wonderful backdrop as a minimal sculpture or prop to elevate a small item or design of your choosing. 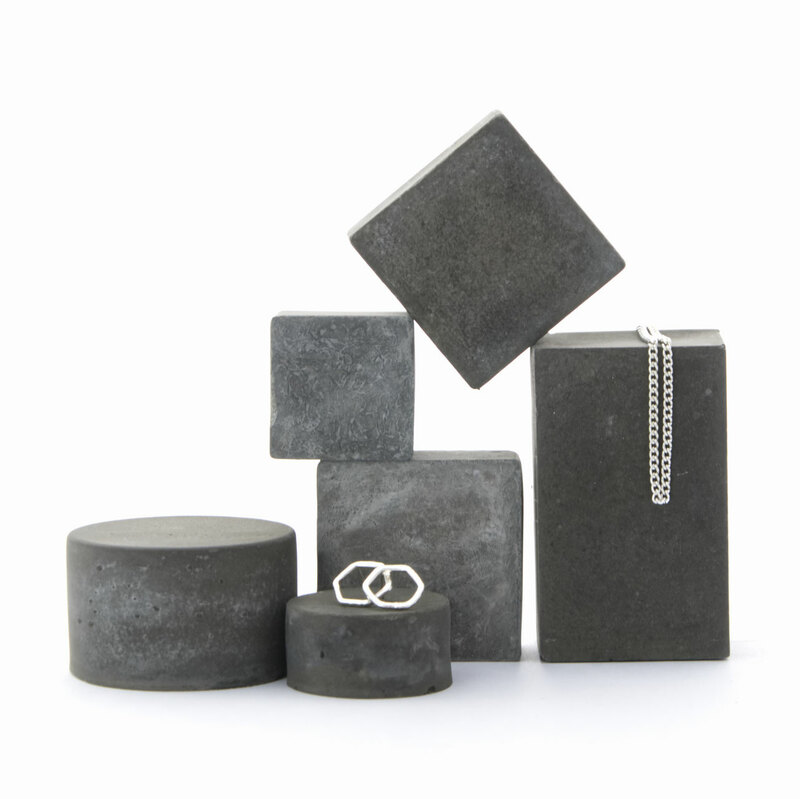 Have a play every time you arrange them to form the base for your jewellery photo shoot, exhibition or retail display, market stand as well as window display. 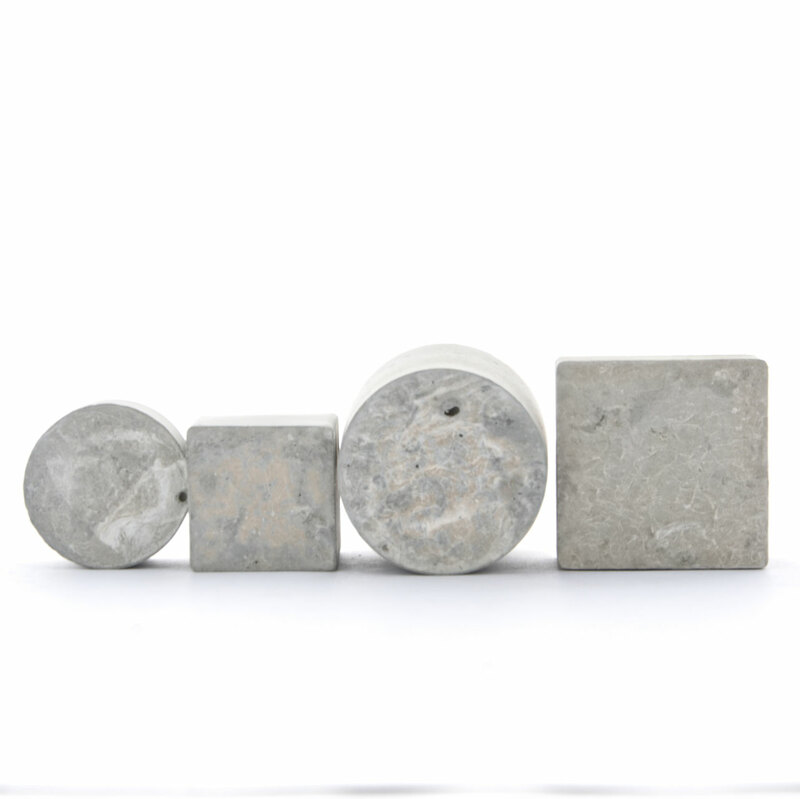 A set of 6 concrete sculpture solids to display and elevate jewellery or other small items like pins or cosmetic. Each of the three cubes and three cylinder prisms features a unique marble effect and allow you to build different contrasts in displays. 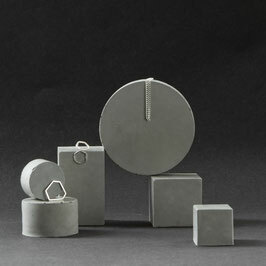 They are stackable, easy to align, overall finished fairly smooth with each solid featuring one matt textured side. It is a dramatic eye-catching set which will create a wonderful contrast to everything shiny and will make a great backdrop at exhibitions, markets and fairs but are also wonderful to photograph. 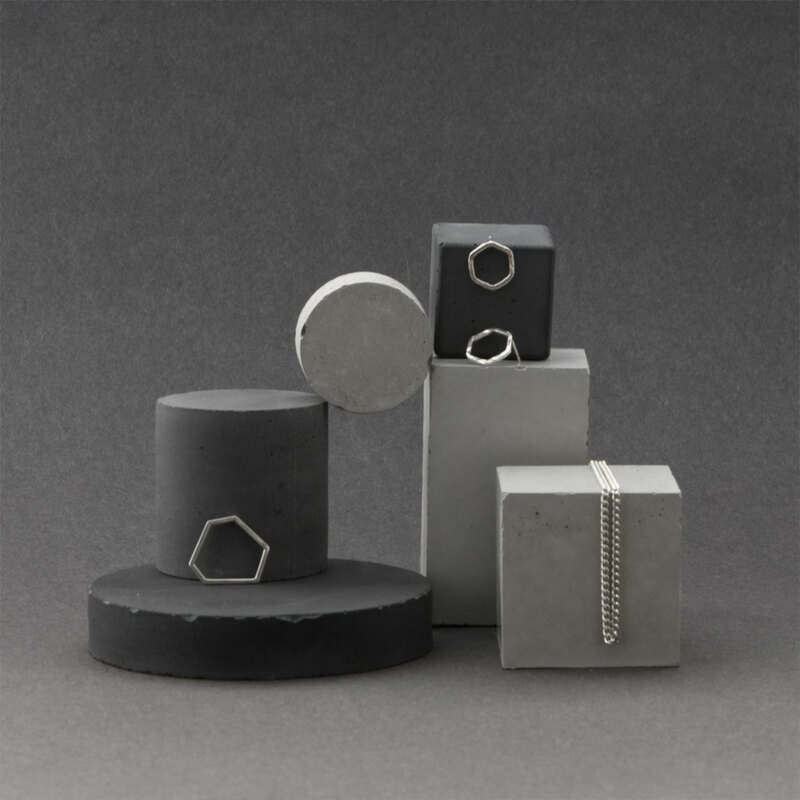 You can never have enough diamonds and this set of varying shapes and sizes comes in a range of grey tones - of mid to pale grey - giving you wonderful opportunities to arrange your display. 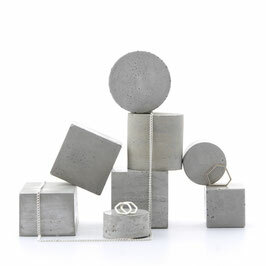 Create a concrete diamond cluster or stack them on top of each other, any shape can display jewellery on varying sides. 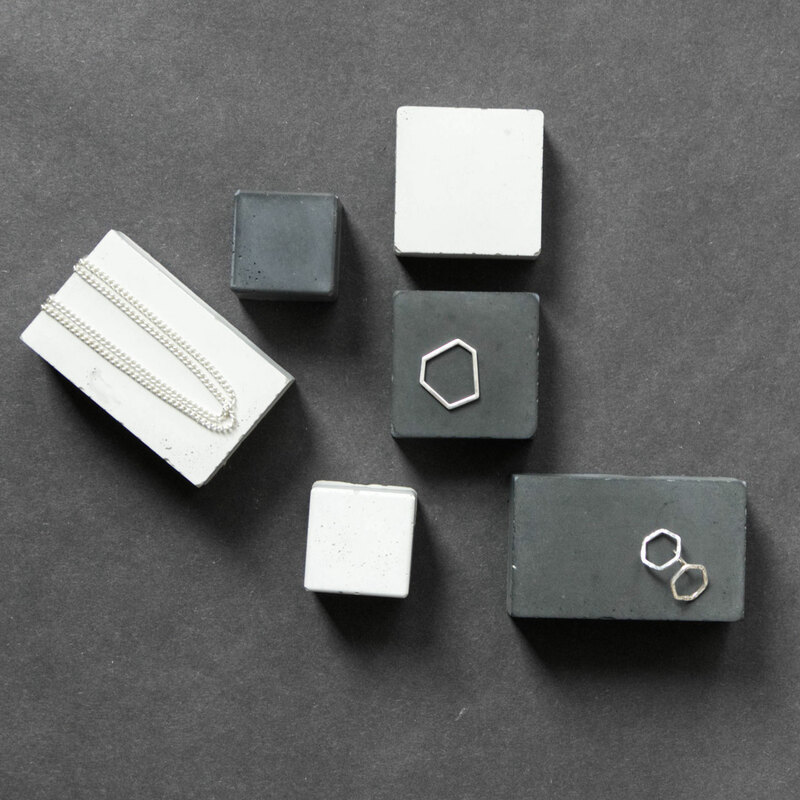 Let your creativity shine combining these geometric props with your rings, earrings or a necklace during a photoshoot or on your market fair or exhibition stand. A wonderful tactile pale grey concrete diamond set to organise and display rings and other jewellery. This sculpture still is eye-catching and can be displayed and enjoyed in various ways. 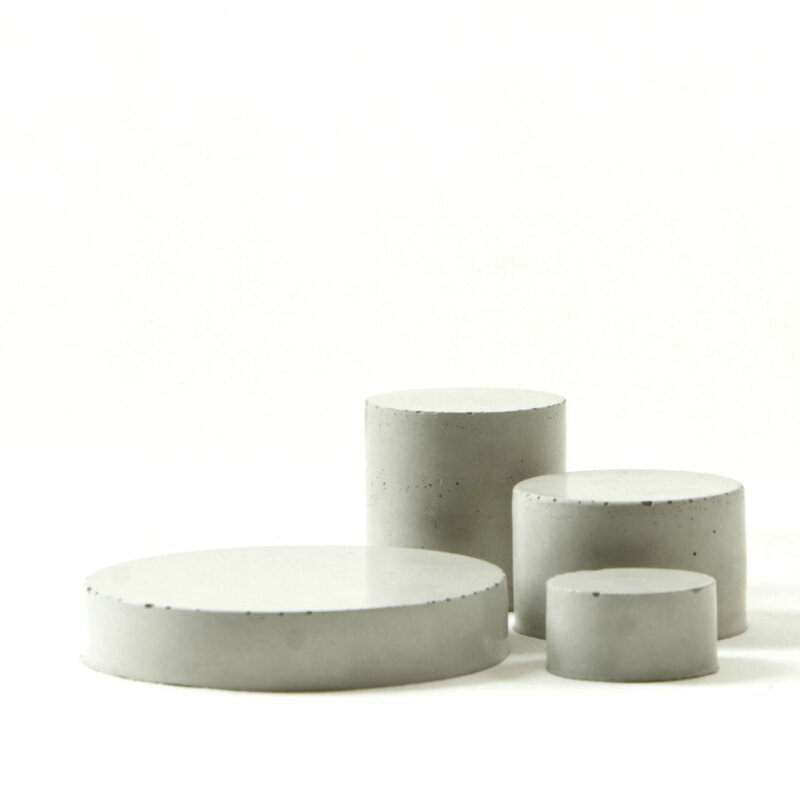 The set features various mid and pale grey concrete shades as well as various shapes and sizes. 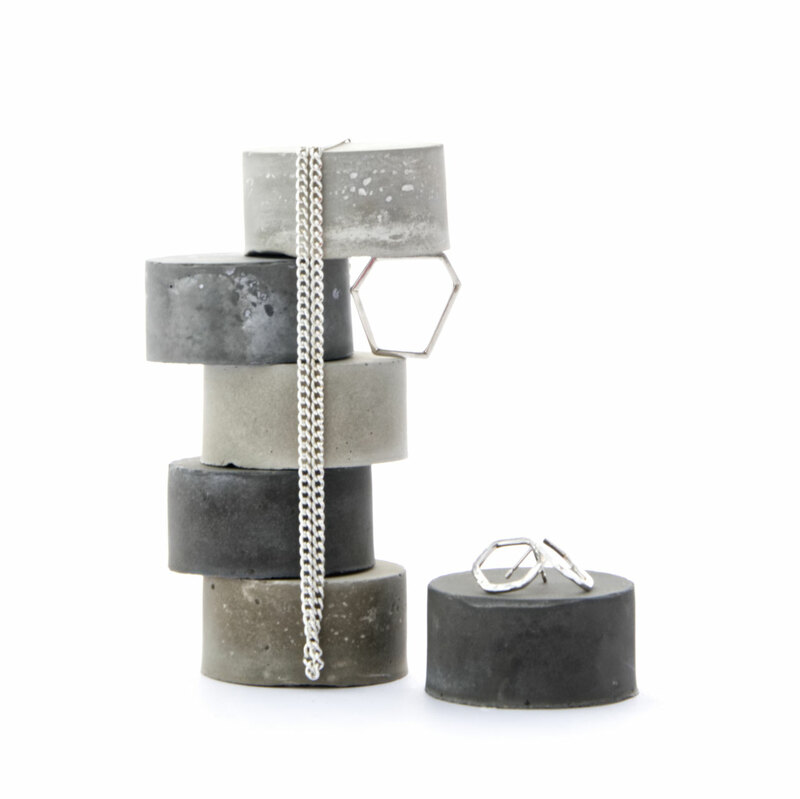 Create a concrete crystal cluster or stack them on top of each other, any shape can display jewellery on varying sides. Wonderfully easy to set up at markets or fairs but also a unique photography prop, especially for rings. 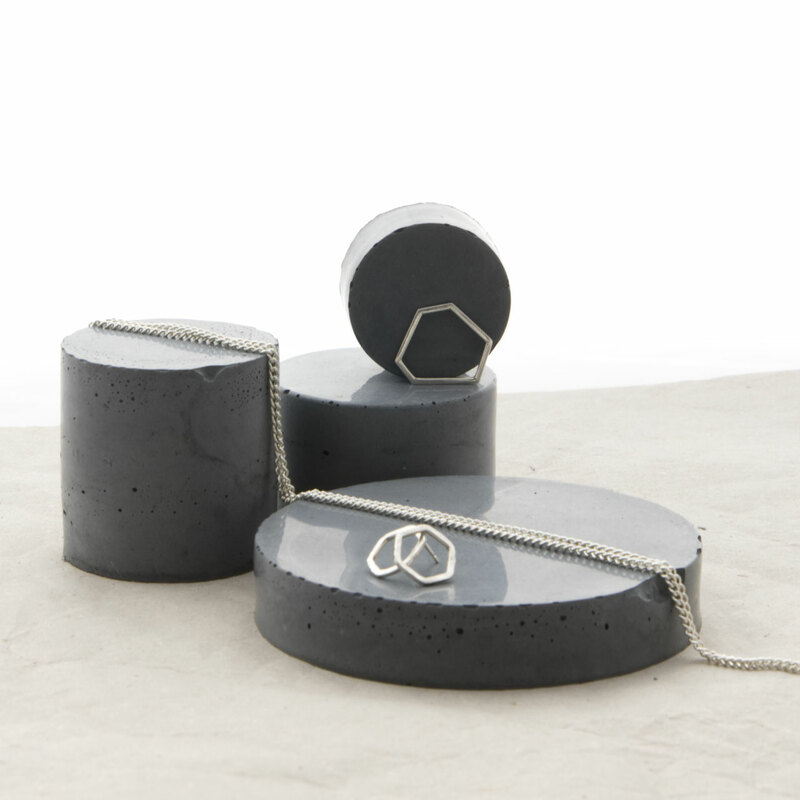 A minimal concrete prism set of three, two rectangular / cube shapes and one cylinder based design, all able to display on various sides offering displays as jewellery trays at market fair or exhibitions. 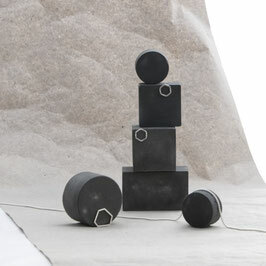 They are easy to align or stack and will create a minimal and timeless backdrop for jewellery or cosmetic products. 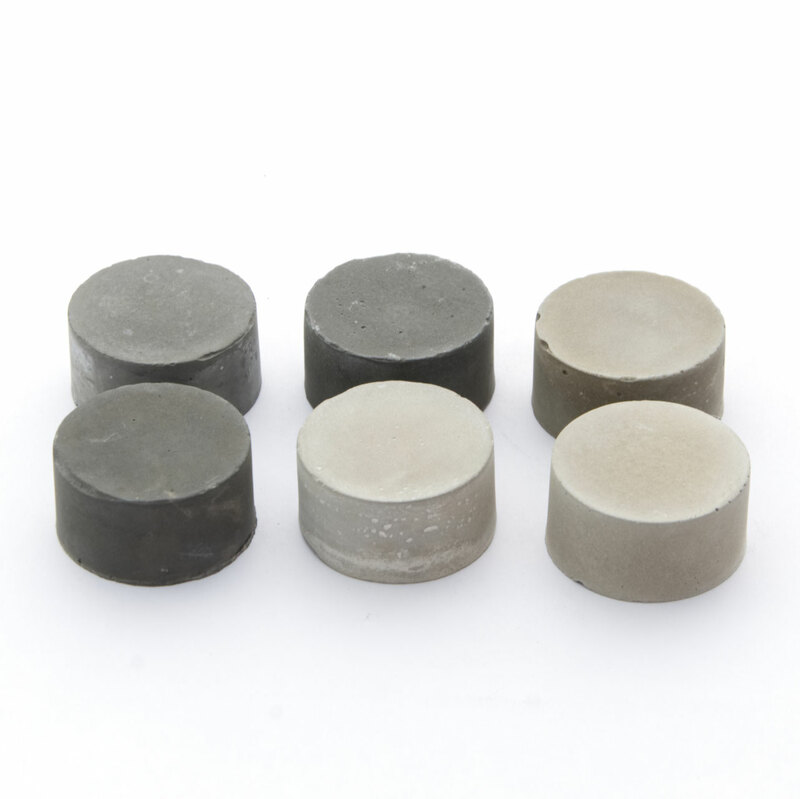 The largest solid is mid grey and has some sandy warm in it to create a bit of depth within the set. 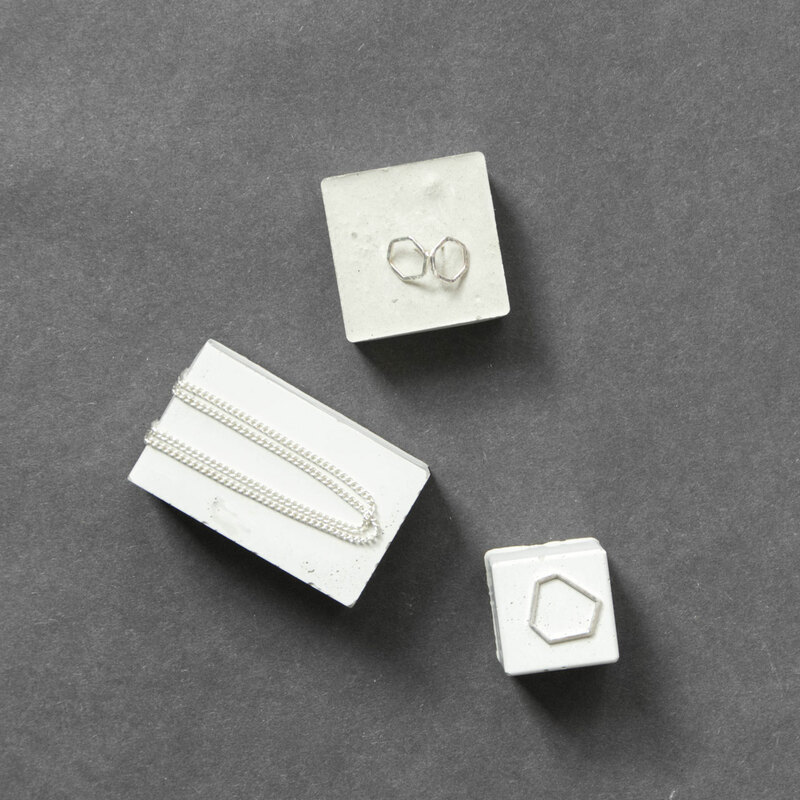 Furthermore, the design features two angled sides which help to easily display necklaces. 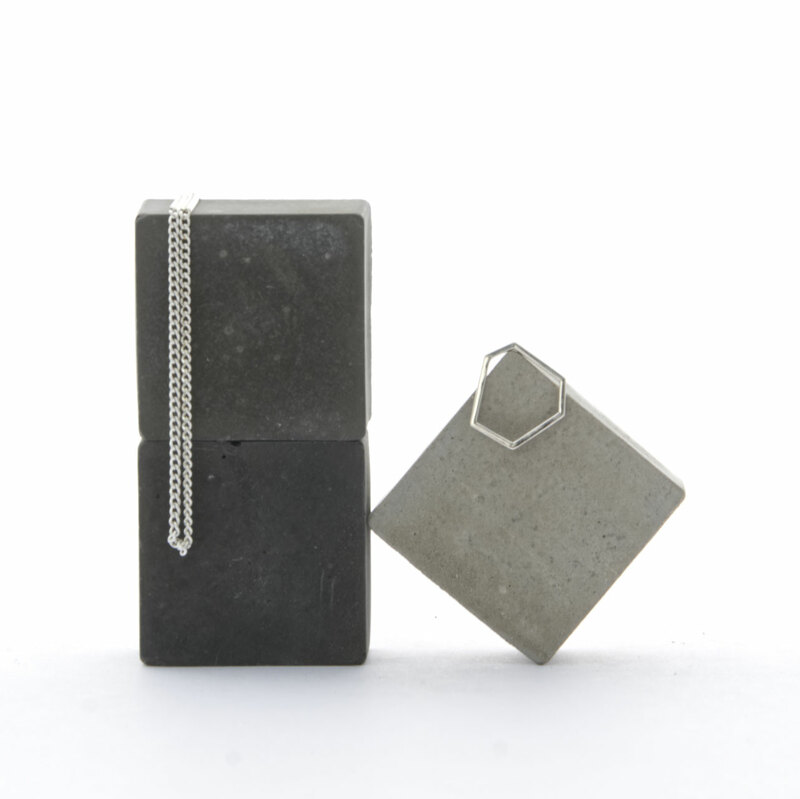 The prisms help to elevate jewellery and other small designs of your choosing. 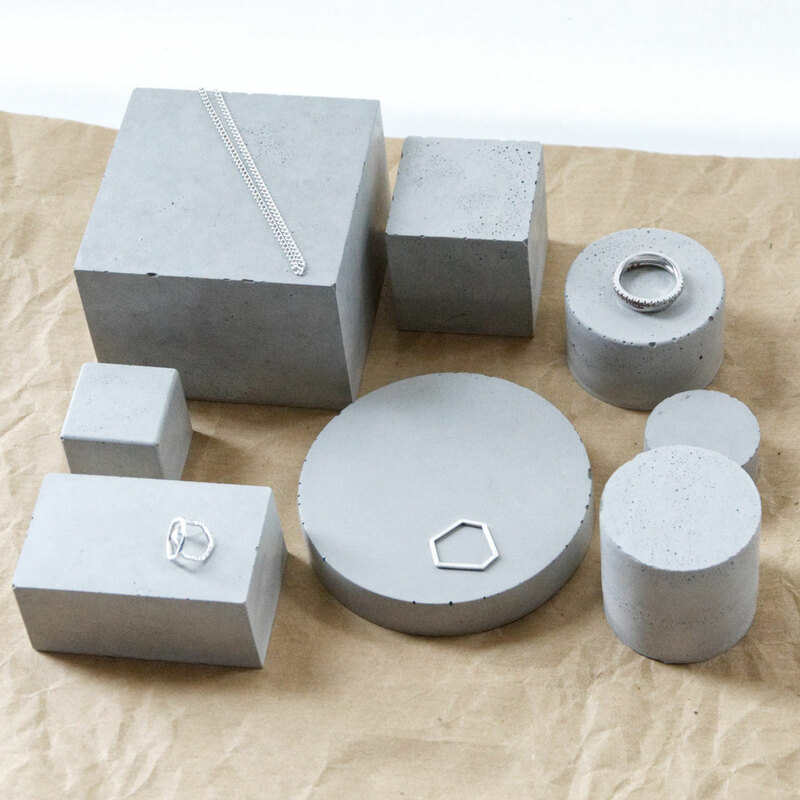 A delightful set of seven uniquely textured geometric concrete shapes to create modern jewellery, pins or cosmetic displays. 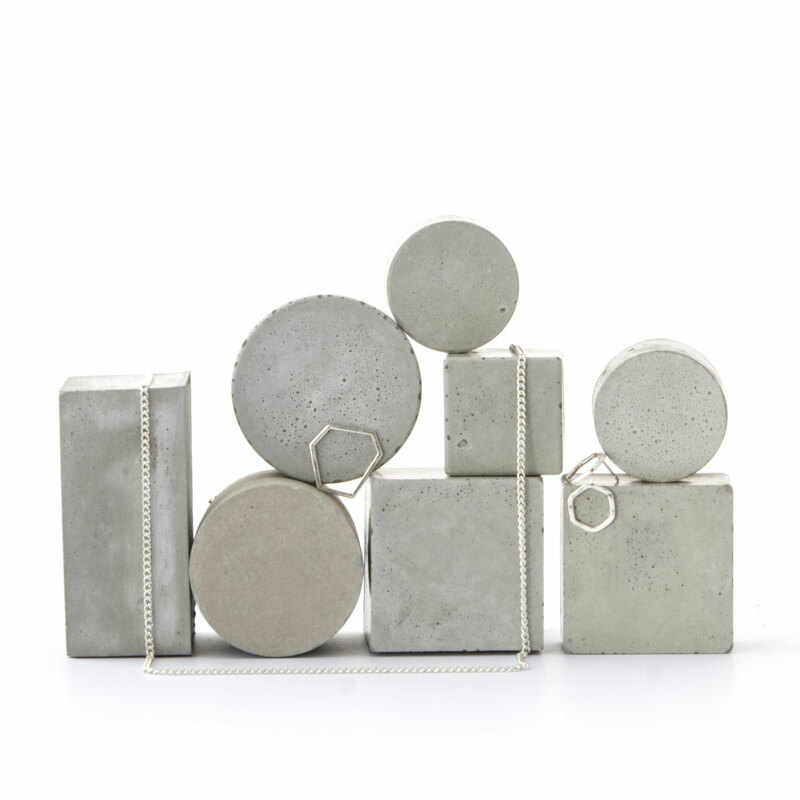 The raw texture of the concrete is very tactile as well as eye-catching and it comes in different shades of pale and dark grey providing wonderful contrast options to the items you might intend to display. Stack or align them, create a flat-lay for photoshoots, exhibition or retail displays, or have a play when decorating a window display.